on july 8th andy and i were on our last journey to montreat with the BPC youth before moving to TN….so july 6th was the end of 13 years at the same job…it was a day of bittersweet thoughts and memories. so as for all of the bittersweet moments on my last two weeks and my last day…i am happy….truely happy. 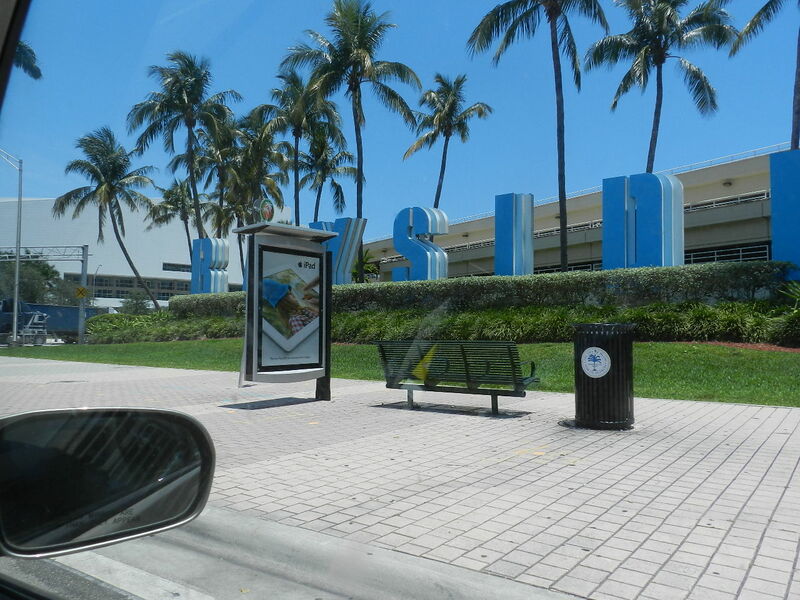 ok so monday morning we woke up early and go back on the road for miami…thank God for GPS. 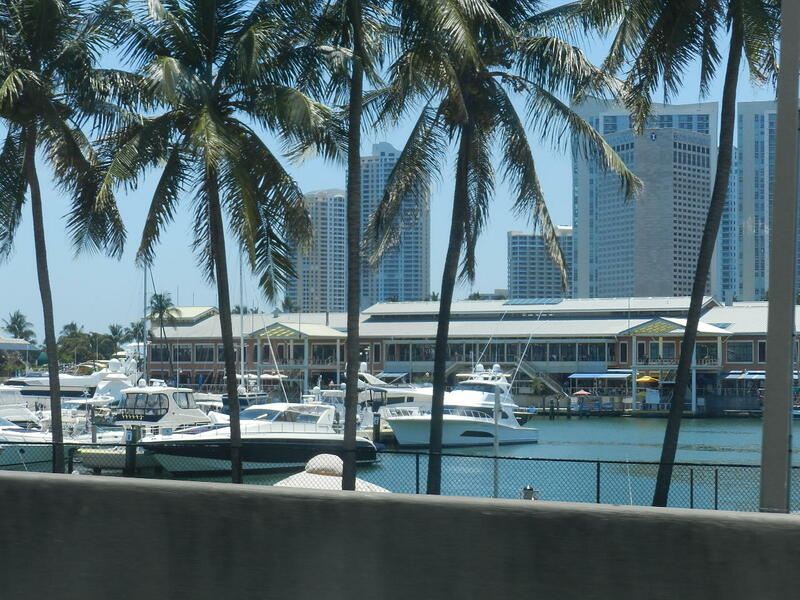 driving to the port was a huge test to my nerves….i was so glad that we had the GPS or we would still be in miami. 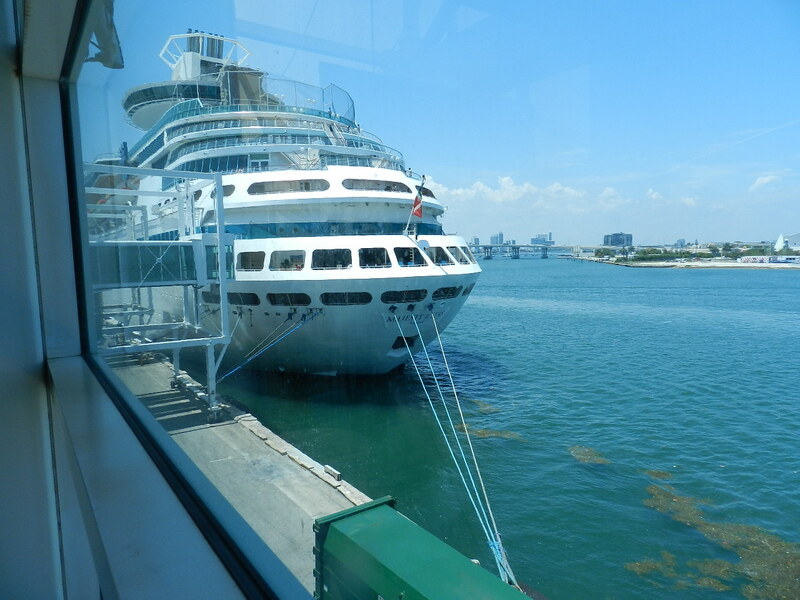 we went to the port to see where we should be and then we went to eat lunch. 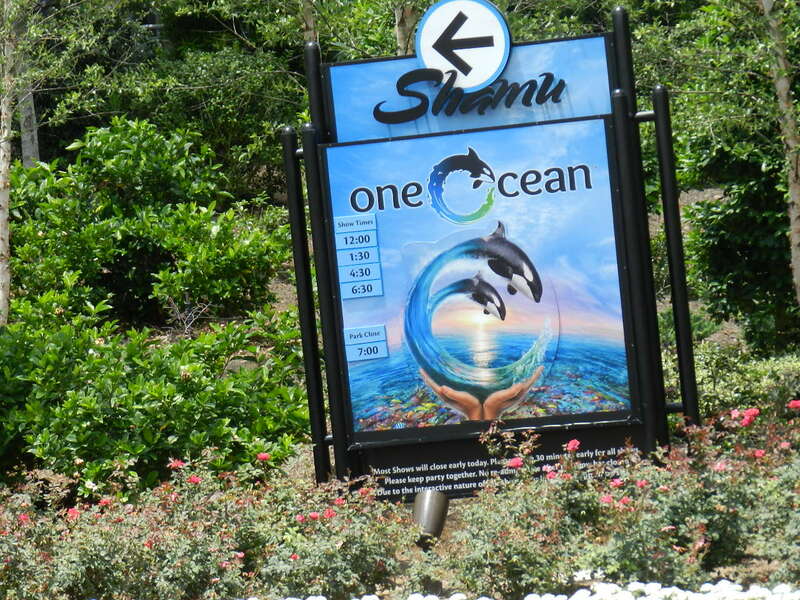 this was a shopping center type outdoor mall place…it was neat. we didn’t have much time to walk around but we did eat lunch there! 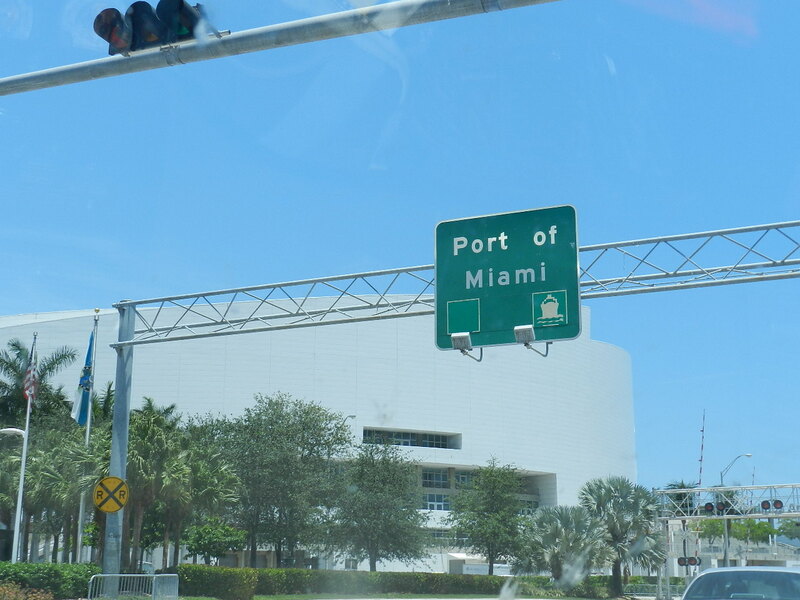 welcome to the port of miami! 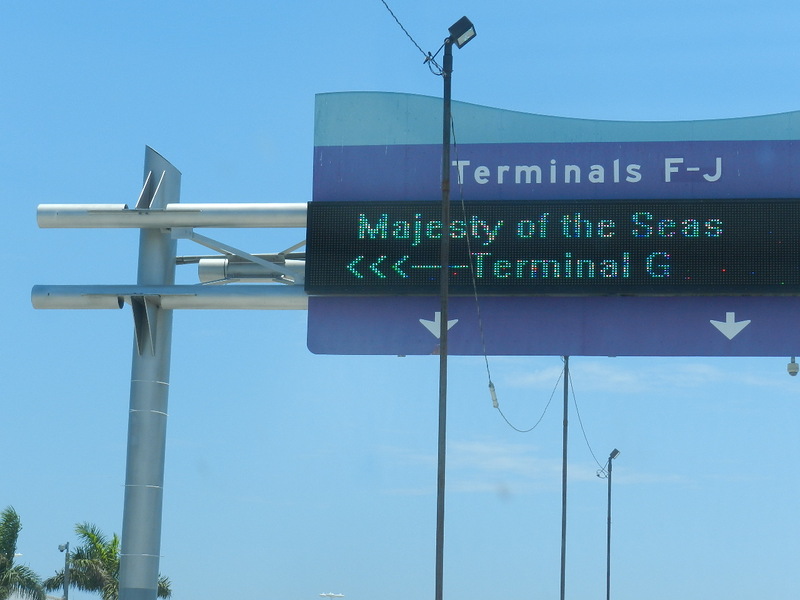 i was so excited to see this sign…i was ready to jump out of the car! crossing over the bridge to the port. i couldn’t get a good pic of our boat. but this was next to ours…at least i don’t think it was ours. 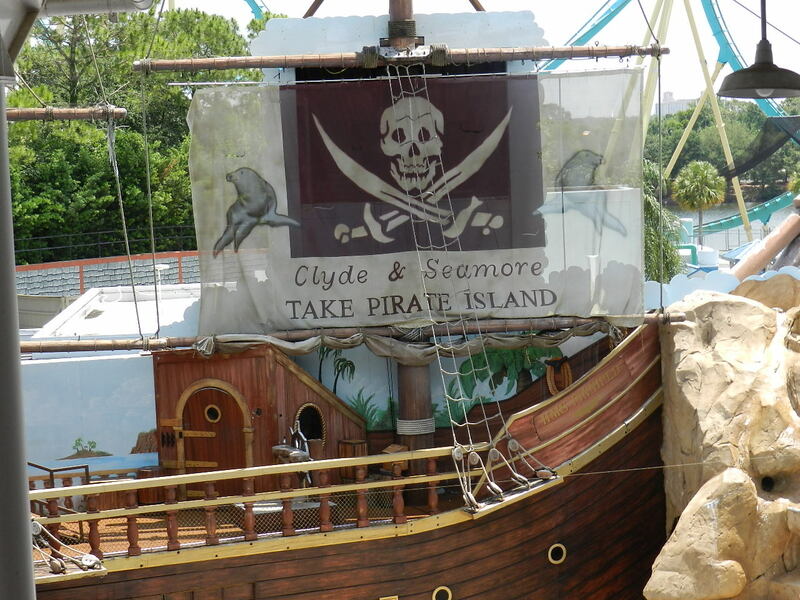 following the signs to our boat and the best vacation EVER! the porter was so nice. he took our luggage and gave us an A+ for putting our tags on right. he pointed us to where we should park and told us to have a great trip! before picture at the car! we took a before the cruise picture! i guess we could have asked someone to take it for us but oh well! 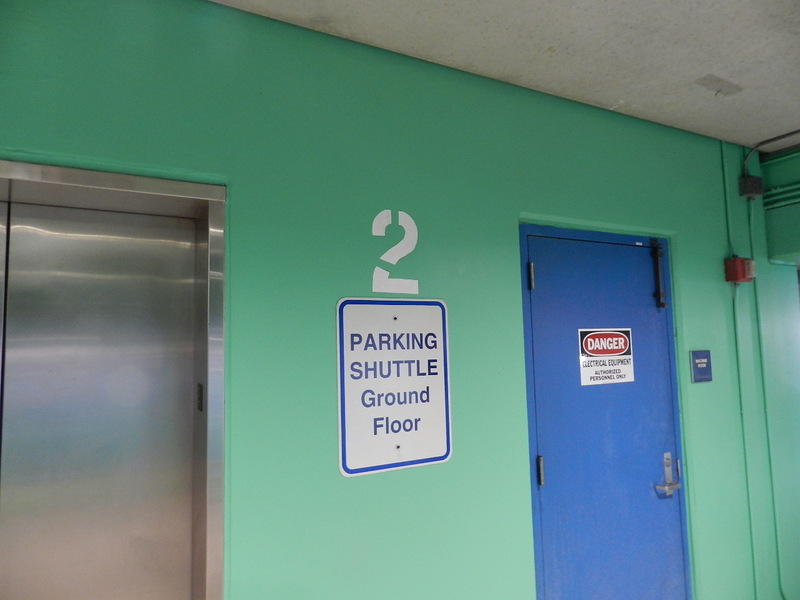 i wanted to remember what level we parked on…so when we got back we didn’t have to walk around for hours! andy didn’t want to take this picture but i wanted one of the banner before we went in. this was the point of no return. 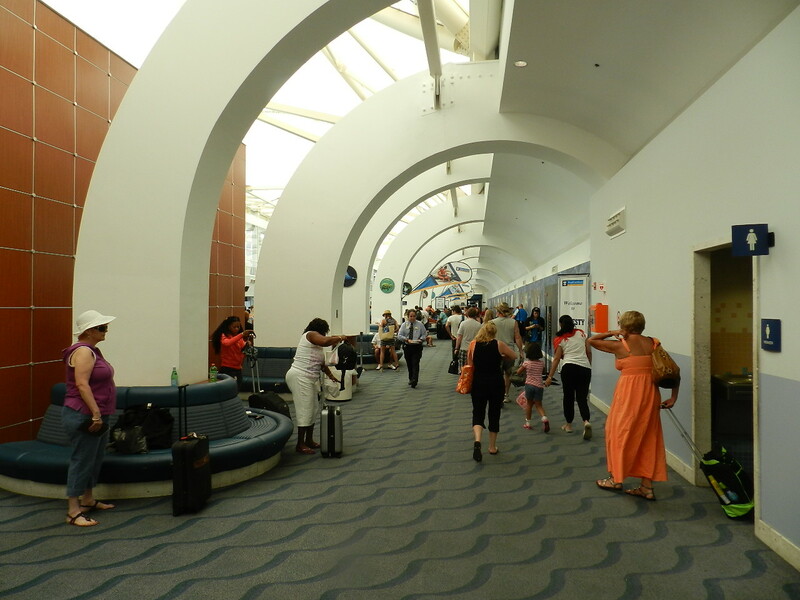 we had to go through security and them went upstairs and had to go through more check in. it was a long process but it didn’t take too long…just a lot of steps and stations to go through. 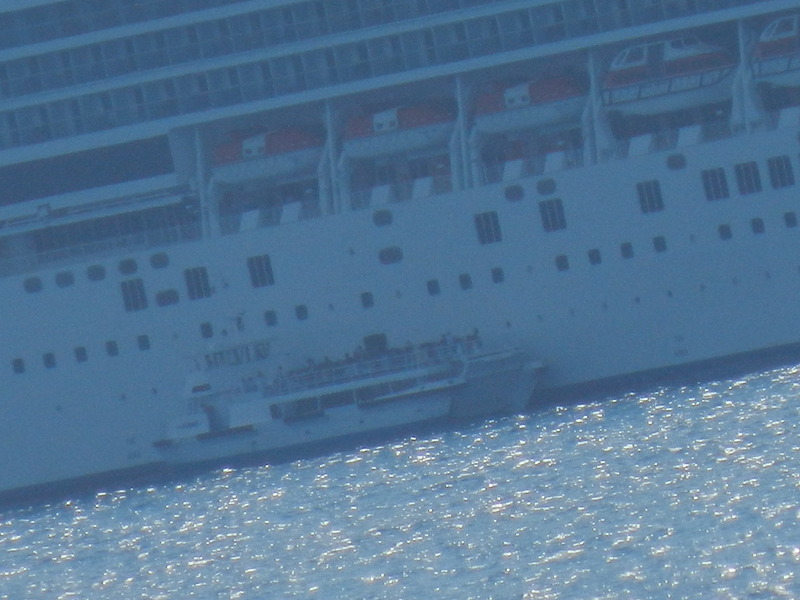 this was the first good view of the boat. this was the first thing we saw when we walked in. andy stopped in the door way and i had to pick up jaw and close his mouth. it was so beautiful and i think he was shocked at how it looked. 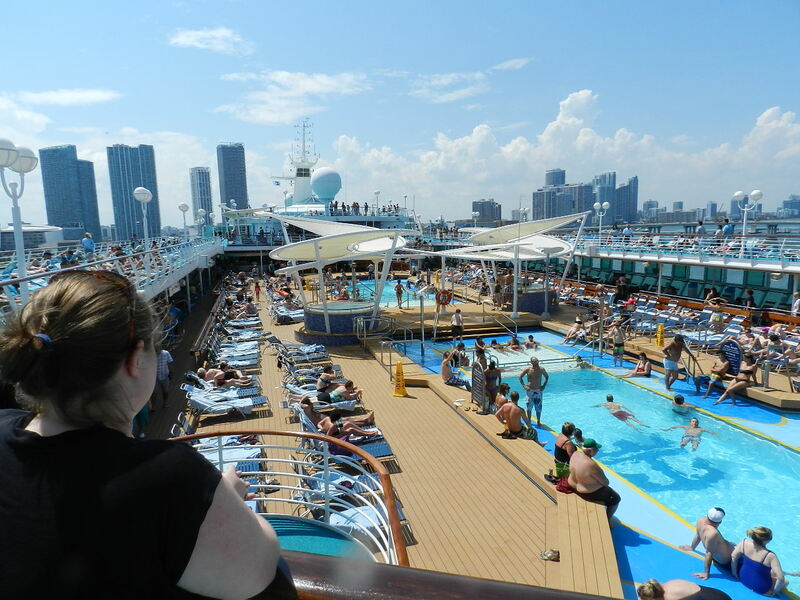 i remembered it looking something like that but it still made my heart skip a beat because i was on a cruise with my husband…a late honeymoon! 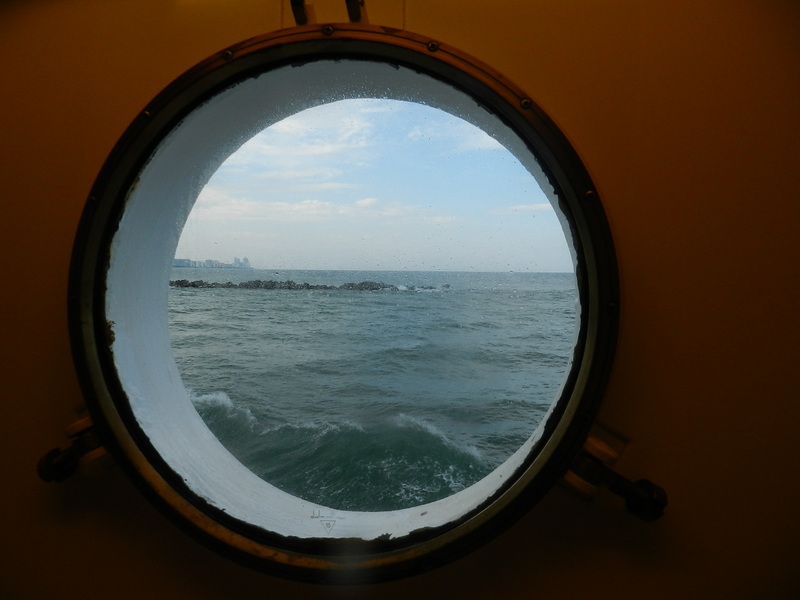 we had a room with a port hole. 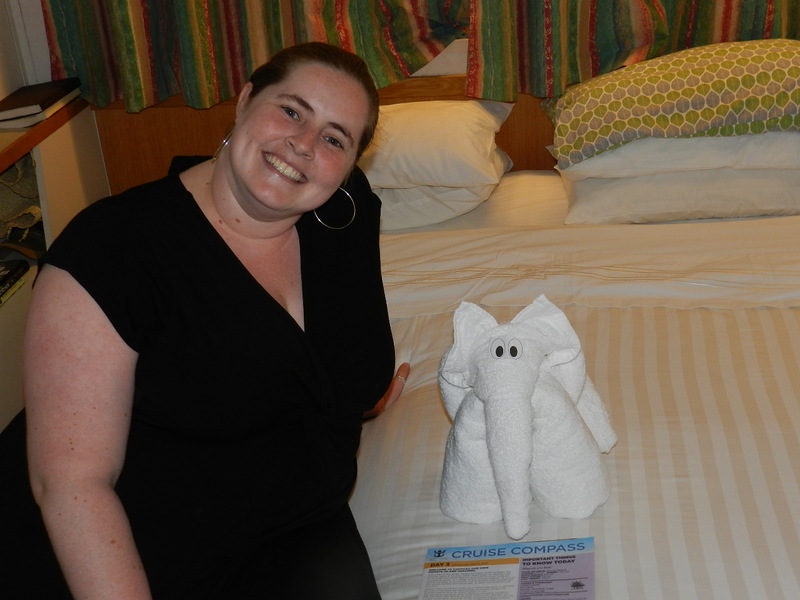 we went to our room and put our carry on bags in the room and took a few pictures. 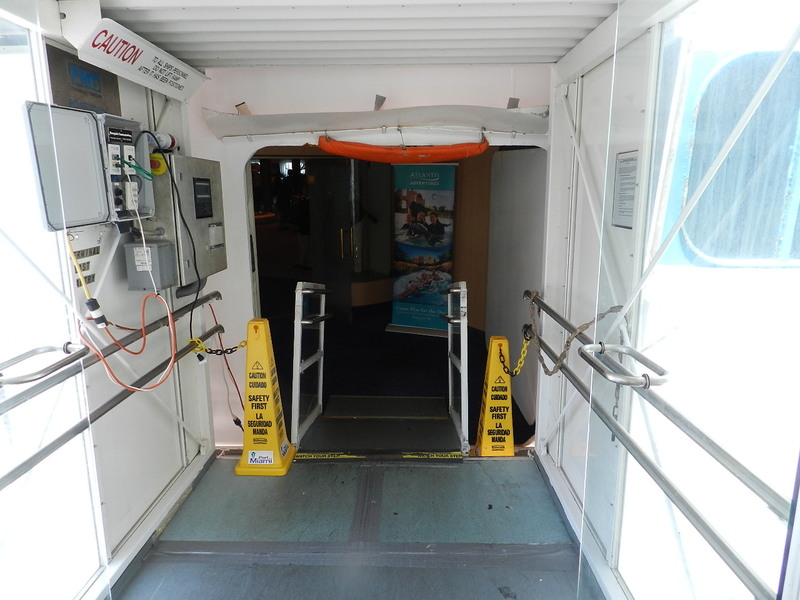 once we got done with that we went to the top deck. 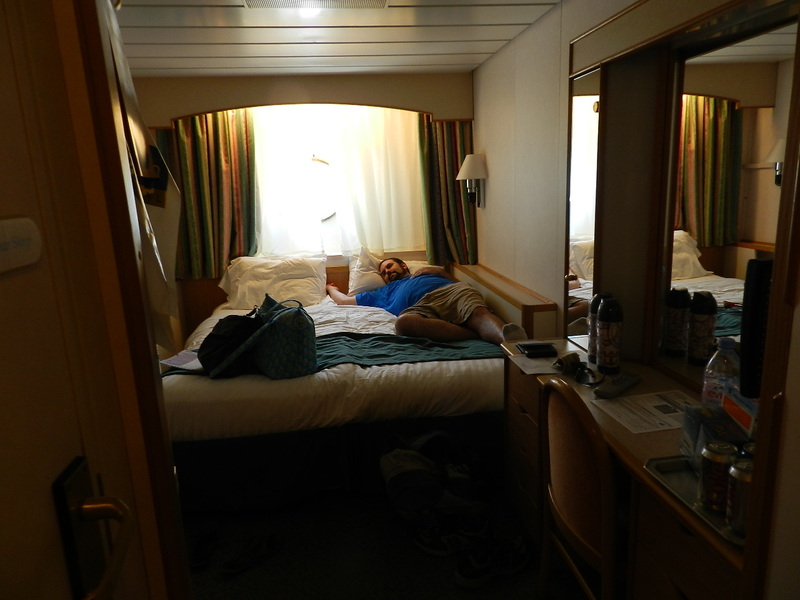 our room wasn’t big, but it was enough room for the two of us! 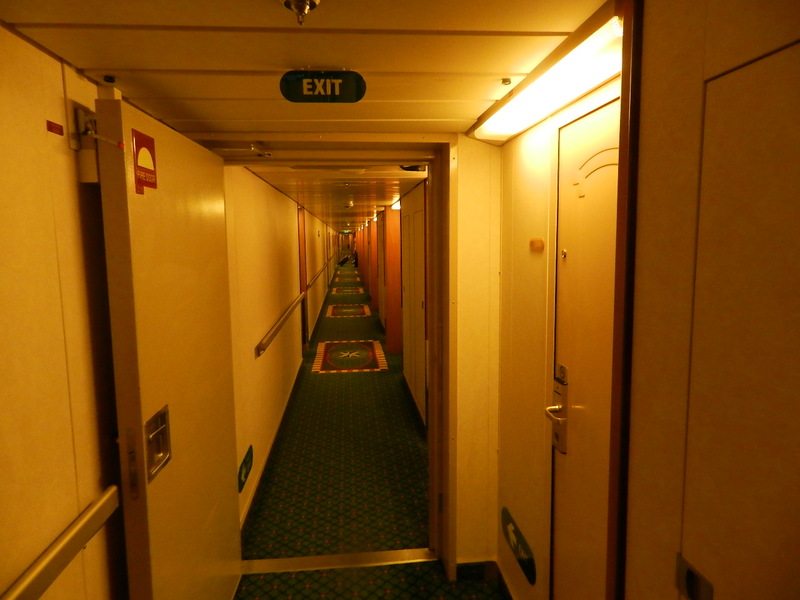 we were close to an exit so that made me feel a little safer…it was a long hall and when all the luggage was sitting there it was a little harder to get around. 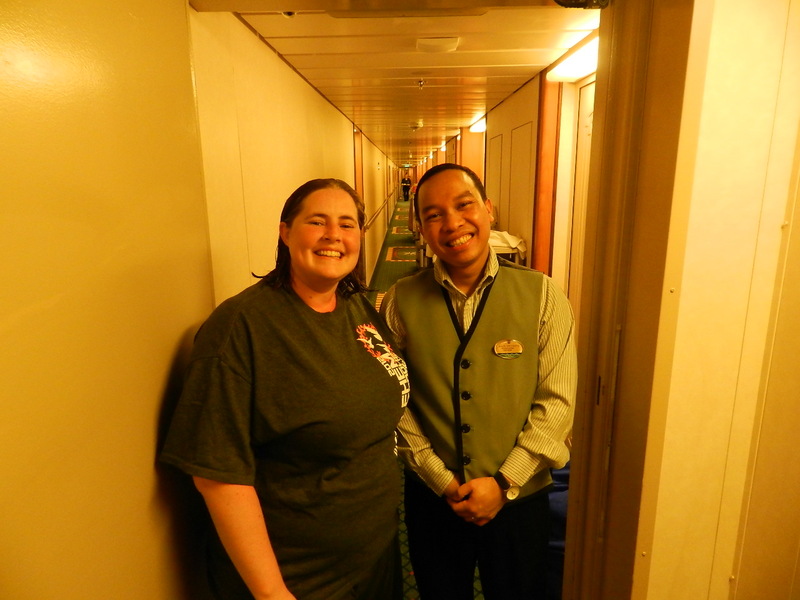 we met our stateroom attendant – imade he was wonderful all week! each time he saw us he would go ooo hi alison (said al-lee-son) he andrew…and would smile and wave to us. he would ask if we had a good day. what we planned to do and what we had been doing that day. 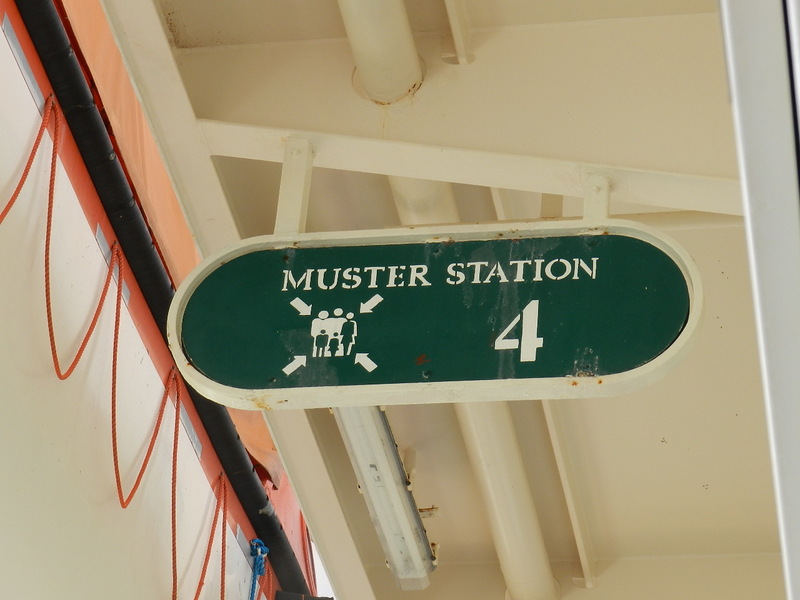 we had to have a muster drill. we went to our station and had to line up. 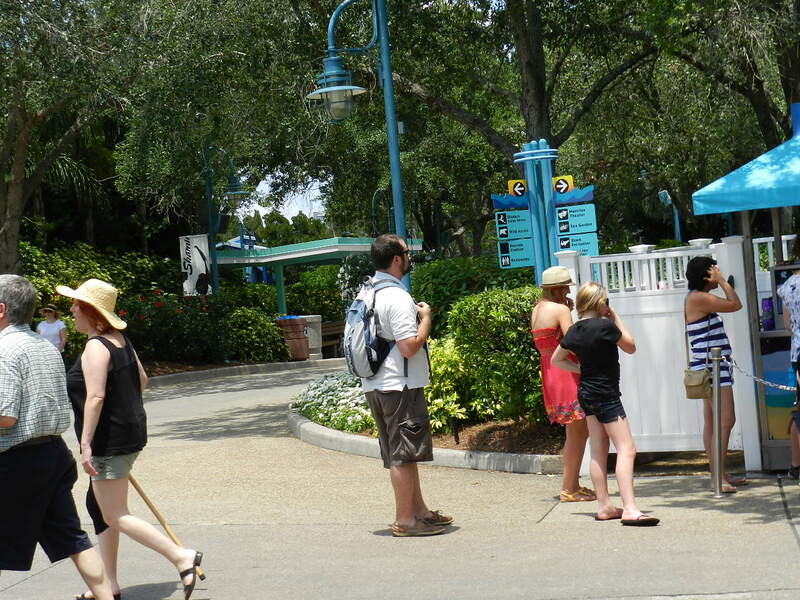 they checked our key cards and we had to stand in line. it took forever. 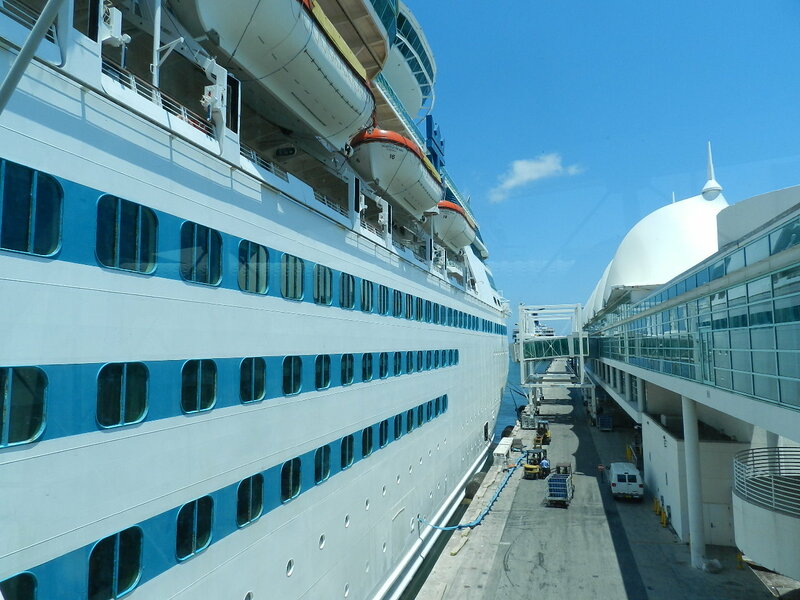 once we were done with it we were able to go to the top deck and watch pulling away from the port. 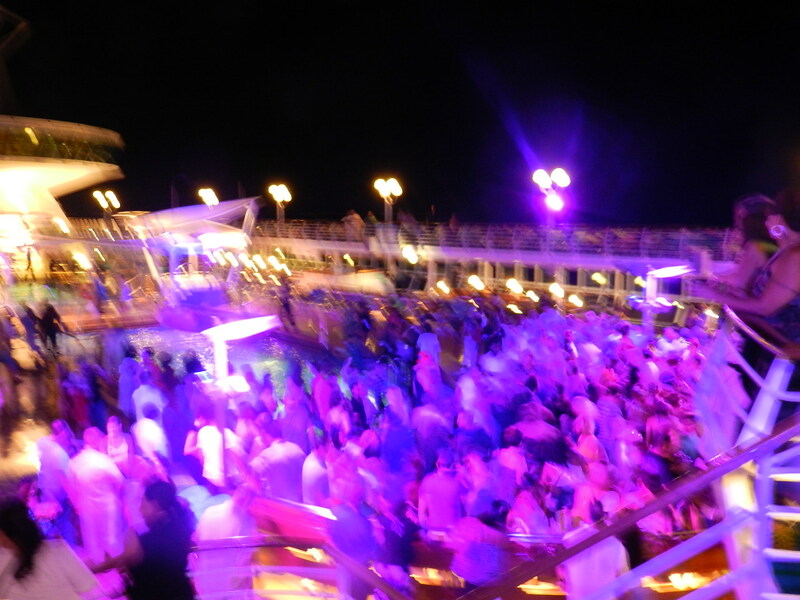 it was a party on the top deck…everyone all ready drinking and having a good time. it was hot in miami. 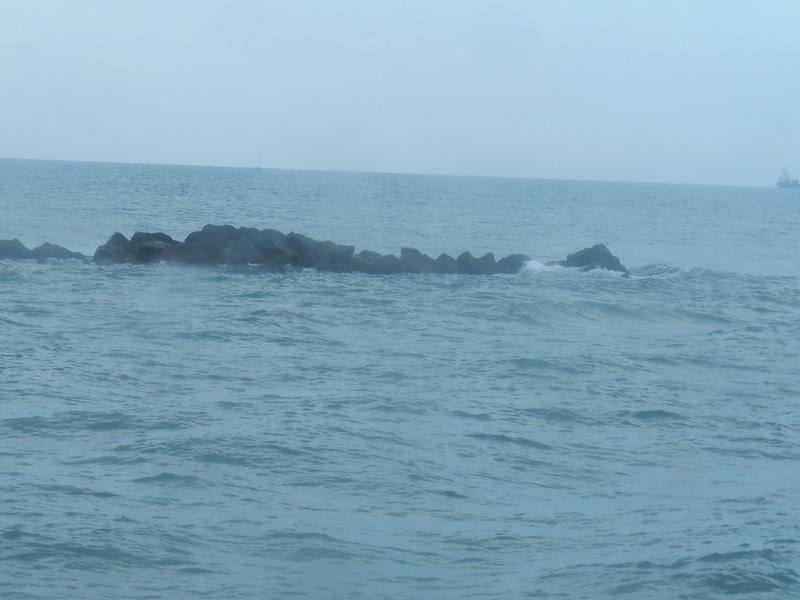 i was so glad when we pulled away from the dock. 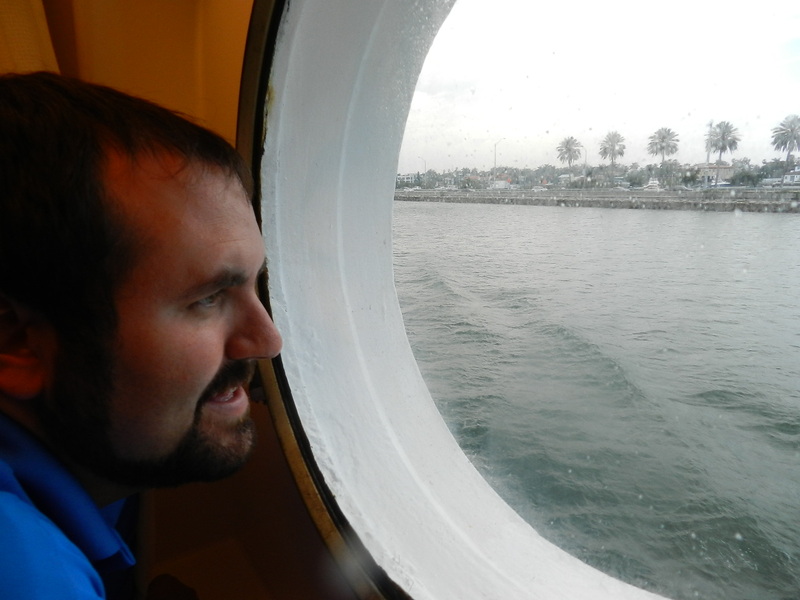 andy was surprised that he couldn’t feel the boat moving all that much. 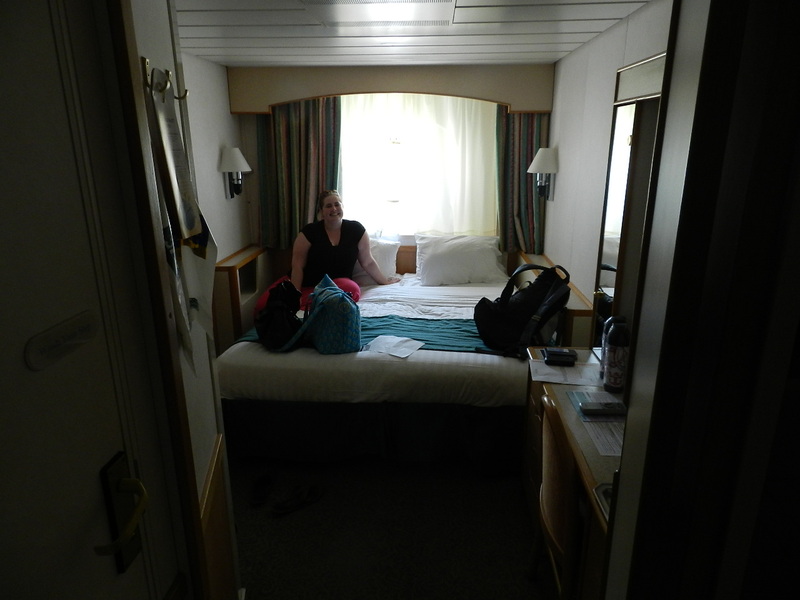 we went back to our room and unpacked our bags and watched miami in our port hole. we had the late dinner at 9. part of the reason we went with the late dinner was so we could have some time when we got off the boat to look around and we didn’t have to hurry to get to early dinner. it was so much fun. looking out the window you could tell we were moving…but not just standing there. as we were leaving we went past the rock wall…this was the end of it…people were walking up and down it almost all the way to the end. 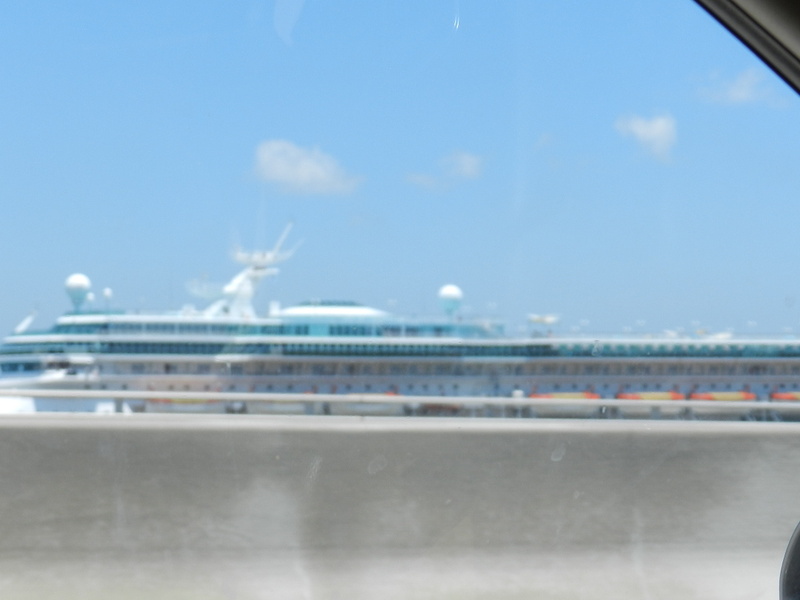 they were all waving to the boats leaving the port. i zoomed out a little more but you can still see the city line and the tip of the rock wall. 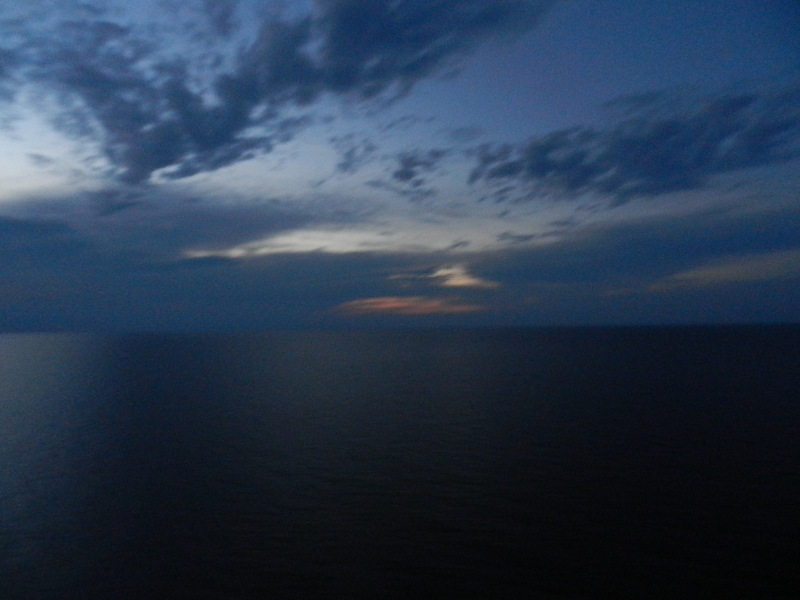 before dinner we went to the top deck and walked around we took some pictures of the sky (it was so pretty). a drunk girl took our picture but it was really fuzzy. we did get our picture taken that night at dinner and we ended up buying it since it was sooo good of us. 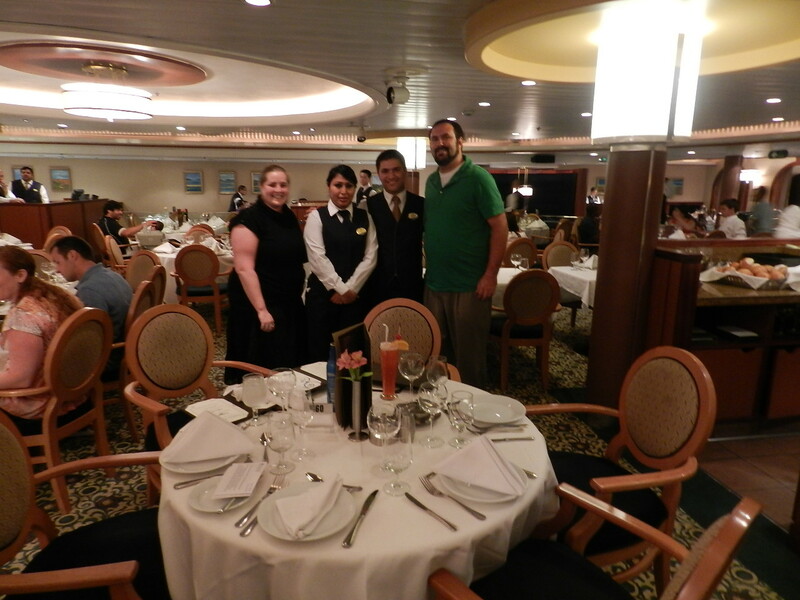 we met our waiter and waitress at dinner. ivica was the waiter i can’t remember our waitress’ name but she was from peru. talking to our waiter was a fun experience. 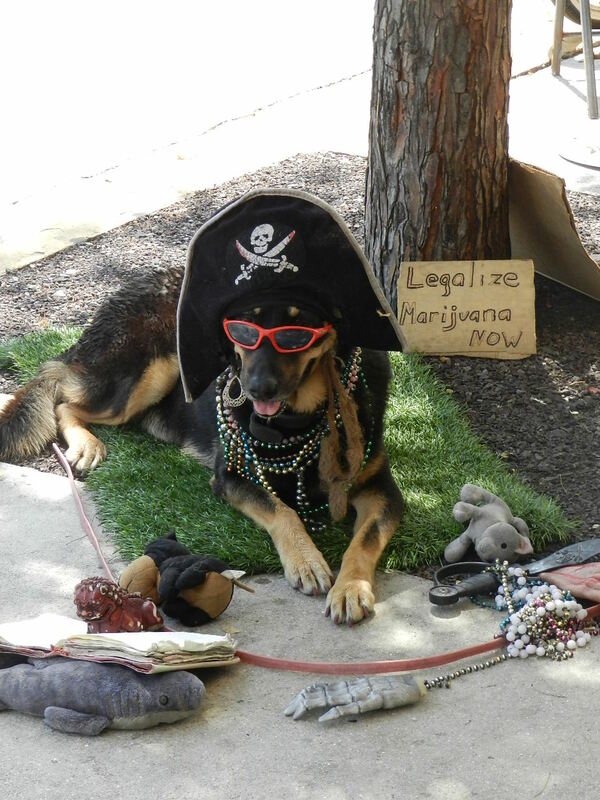 he was really cool. we had a couple from miami at our table…they ended up only eating with us 2 times and a couple from OH who only ate with us that first night. we had dinner to ourselves one night. it was fun. 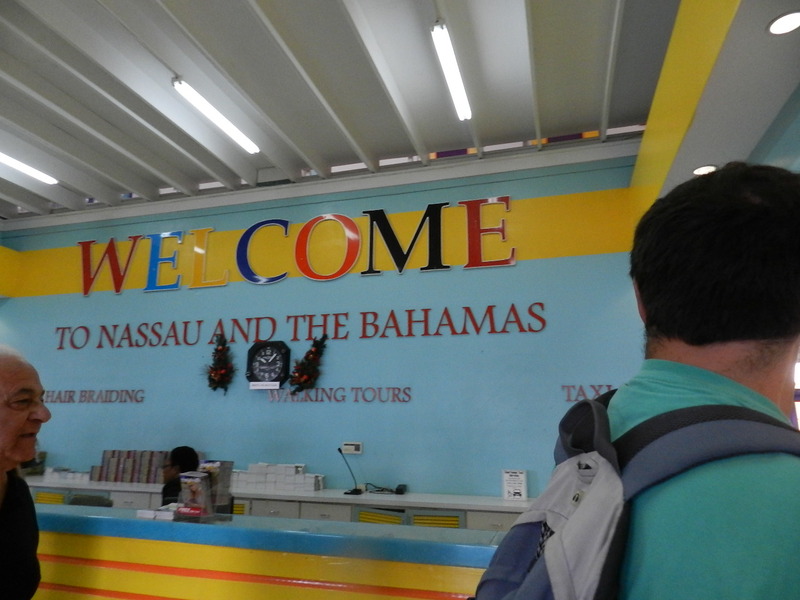 when we went to bed we were a sea and when we woke up we were in nassau bahamas. 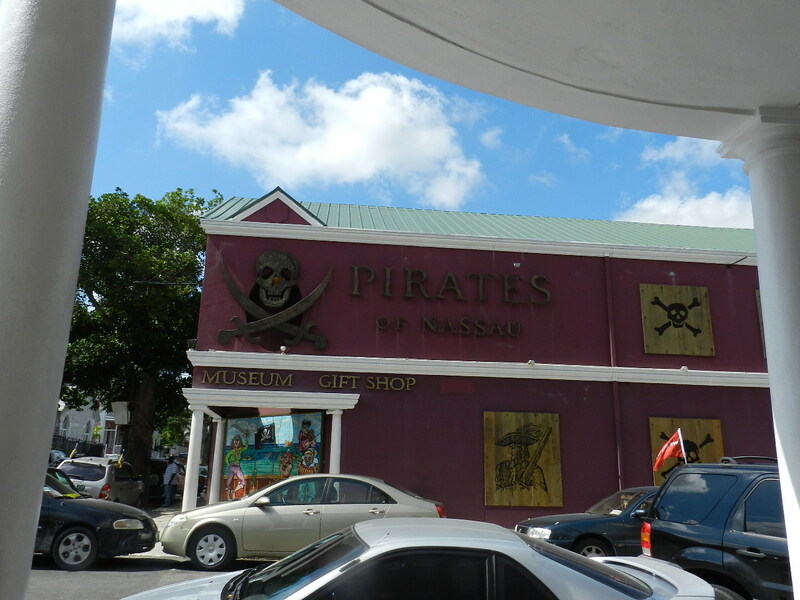 our waiter suggested a few places to go so we went to the pirate museum. it was neat. 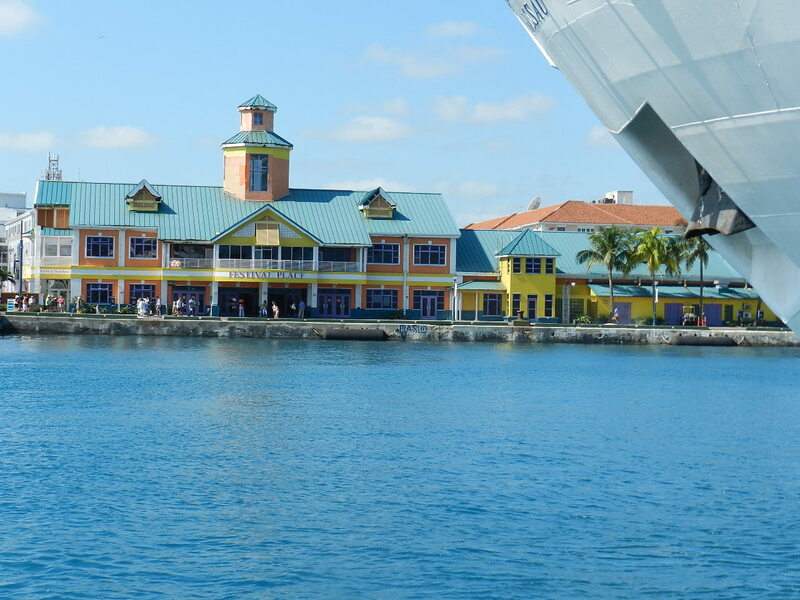 this was the custom house i think…we had to go through there to get to the streets. it seemed like it was a safe place where the tourist could gather their thoughts before getting overwhelmed by the locals. it was really neat to see this. 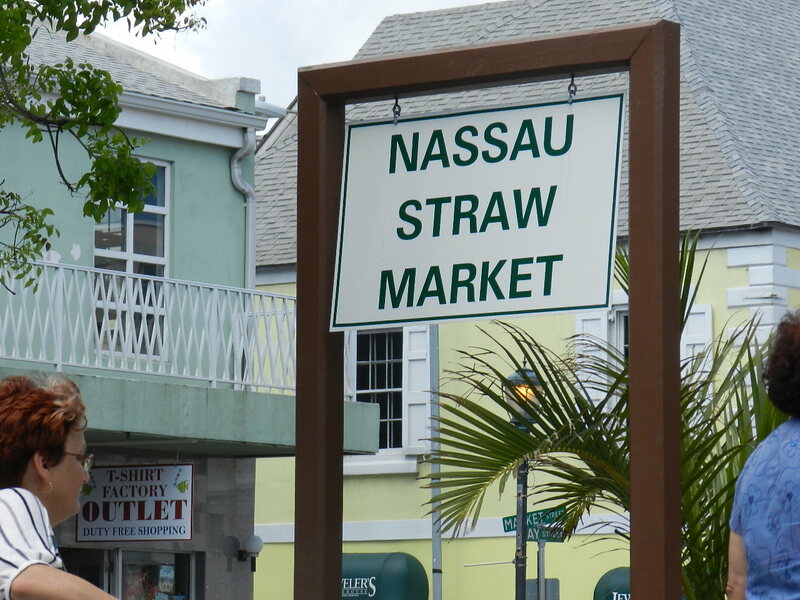 when i was here with my parents years ago…this was the straw market…but that has been moved. 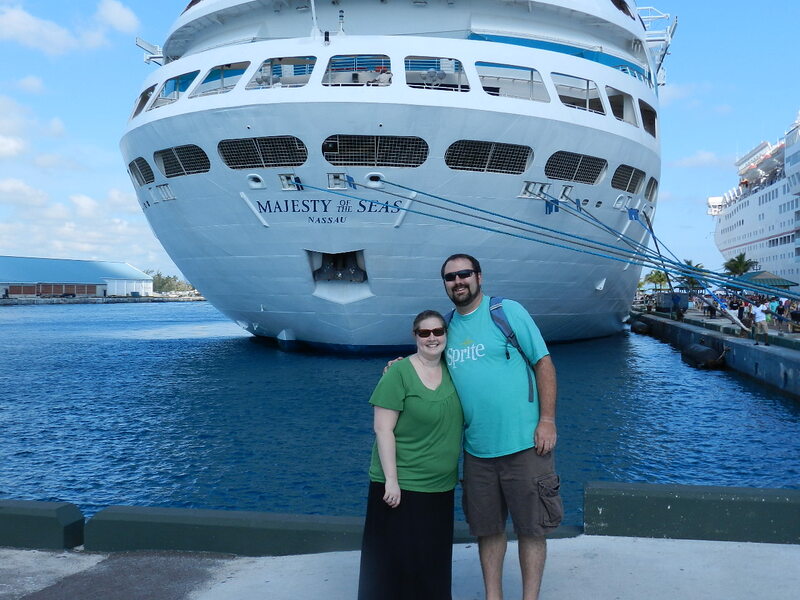 a couple took our picture in front of our boat. 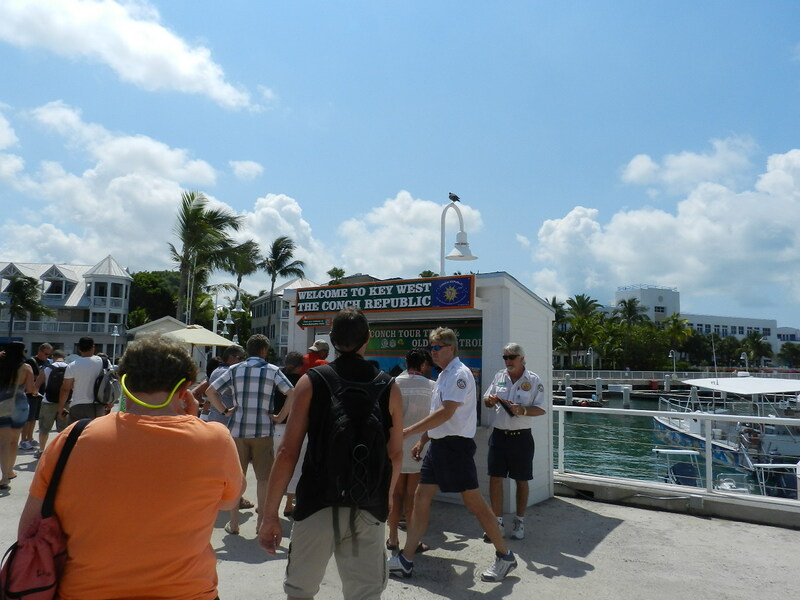 (they were on the boat beside ours for their sons wedding – a few days away that was to be in key west). it took us a few minutes for the guy to learn how to take a picture but we got it! 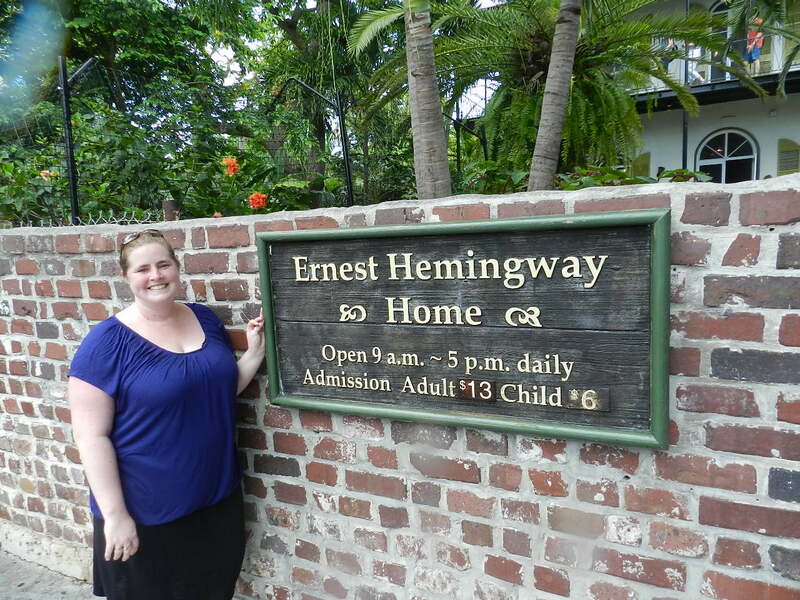 it was really neat…it was a lot of information! we bought some stickers from the gift shop. we went through part of the straw market…i got overwhelmed by everyone wanting me to buy their stuff. we did buy some stuff but not from the market. 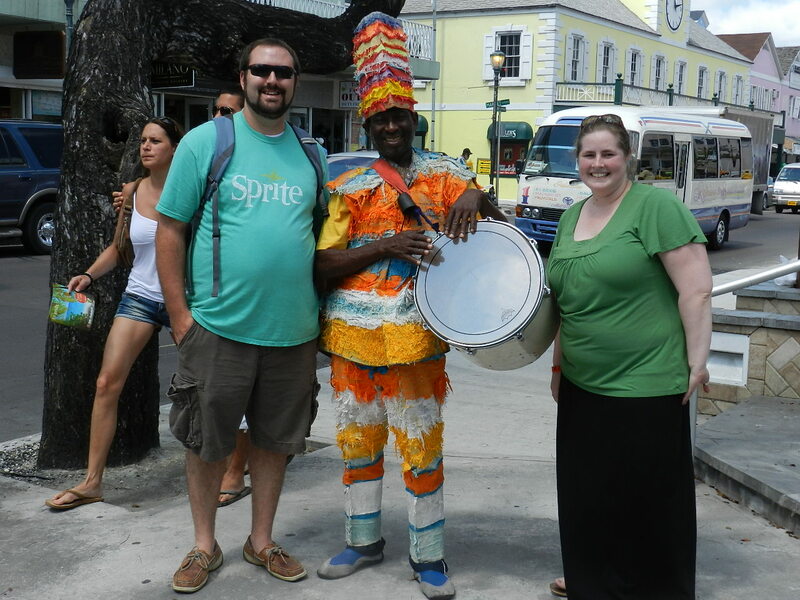 we took our picture with randy the pinata man (i am sure he doesn’t know we called him that…but he sort of looks like it). i was a little nervous to give my camera up to have this one taken…but i knew we could run her down if we had to. 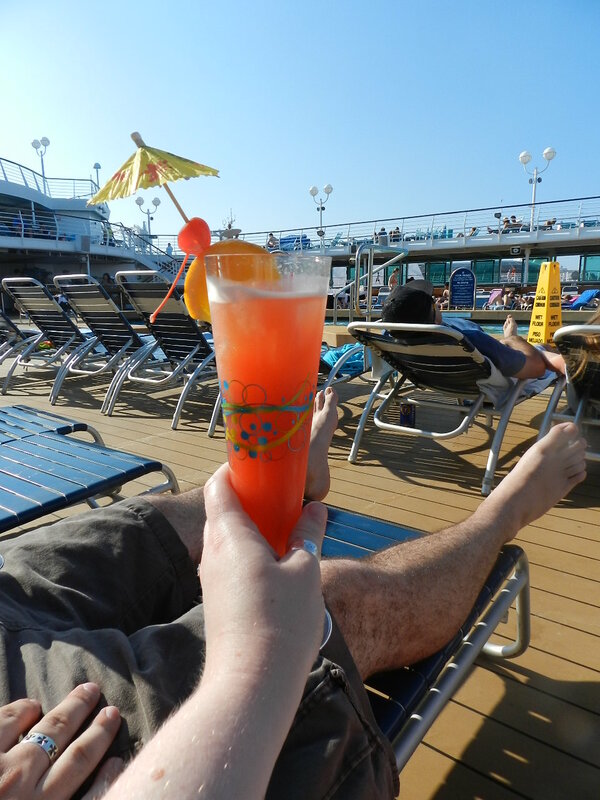 we got the special of the day which was a bahama mama….and oh my it was strong. 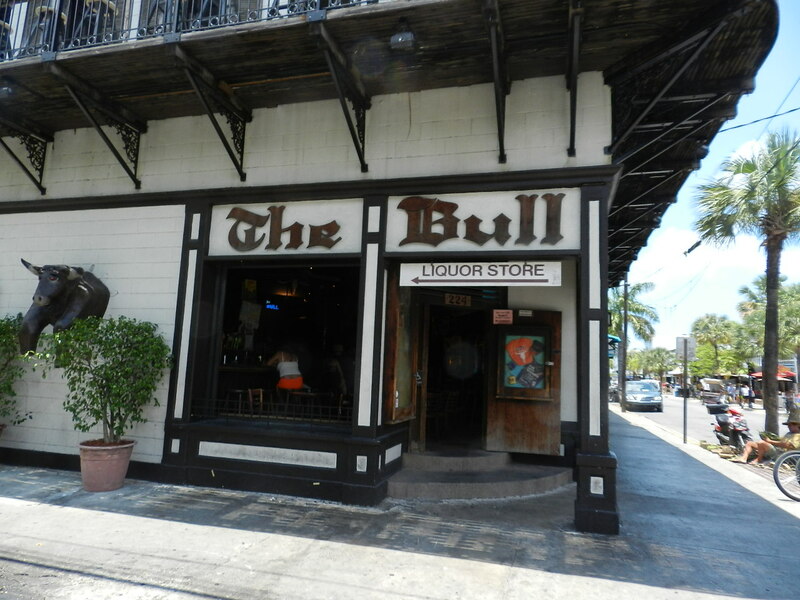 i guess it was the heat plus the alcohol and the gallon of rum but my head was spinning….i wrote an email under the influence of a bahama mama…we didn’t call anyone we just sent emails. but it was good. we went to the newly wed game show after dinner. it was super funny. 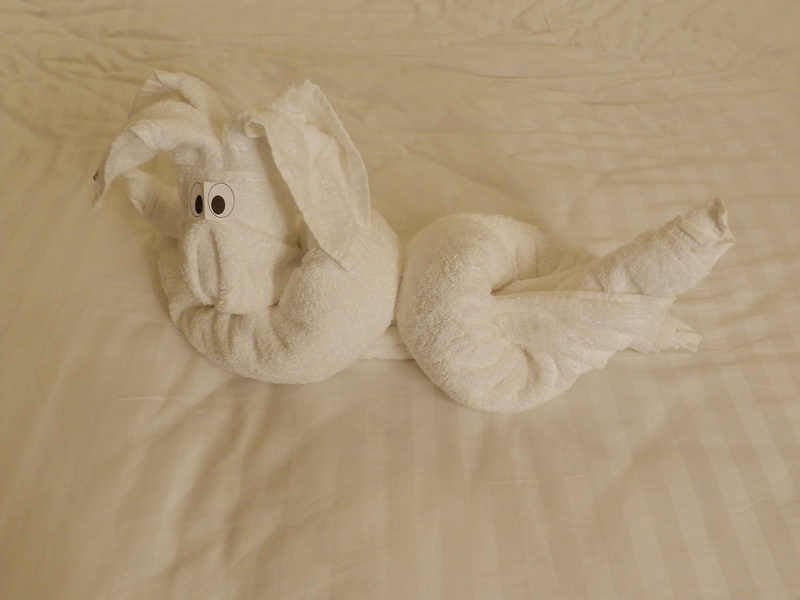 we laughed for the rest of the cruise about it. 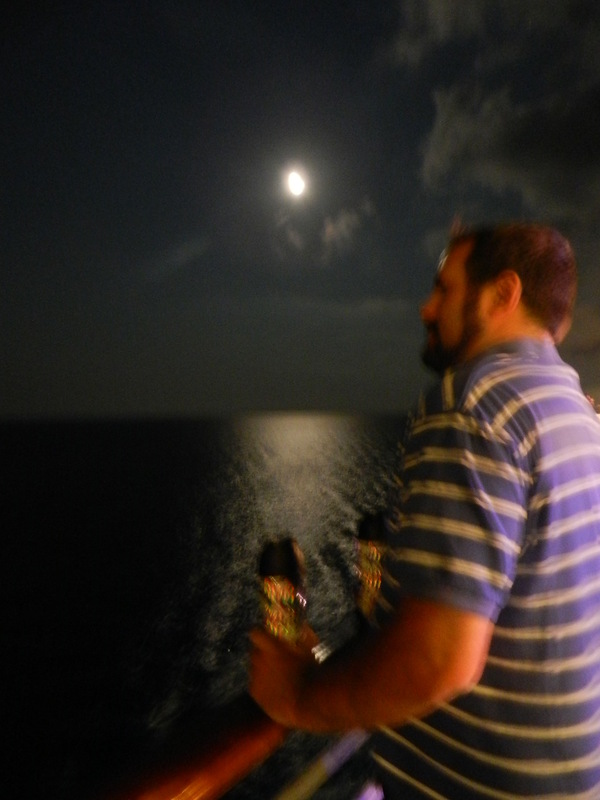 a little blurry but andy looking out at the open sea….the other side was the disco. 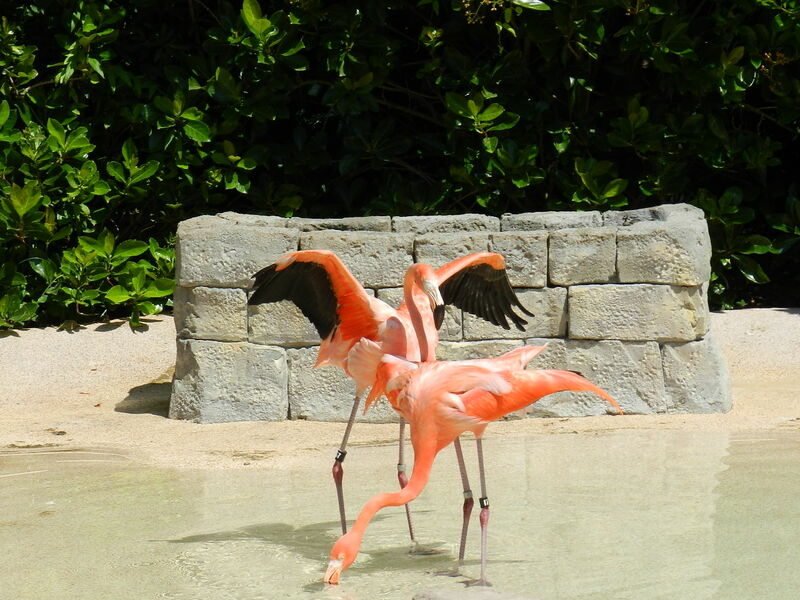 dance around the pool! 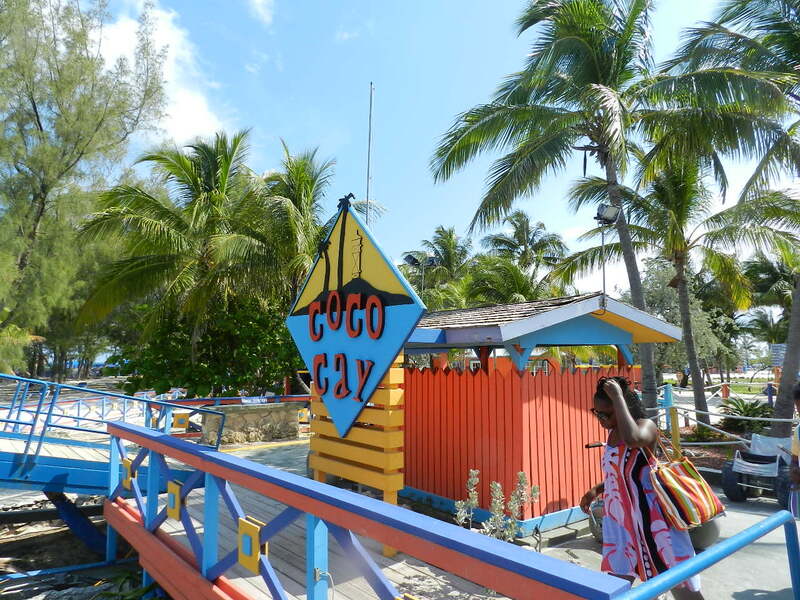 when we went to bed we were a drift again in the open sea and when we woke up we were docked outside of coco cay. 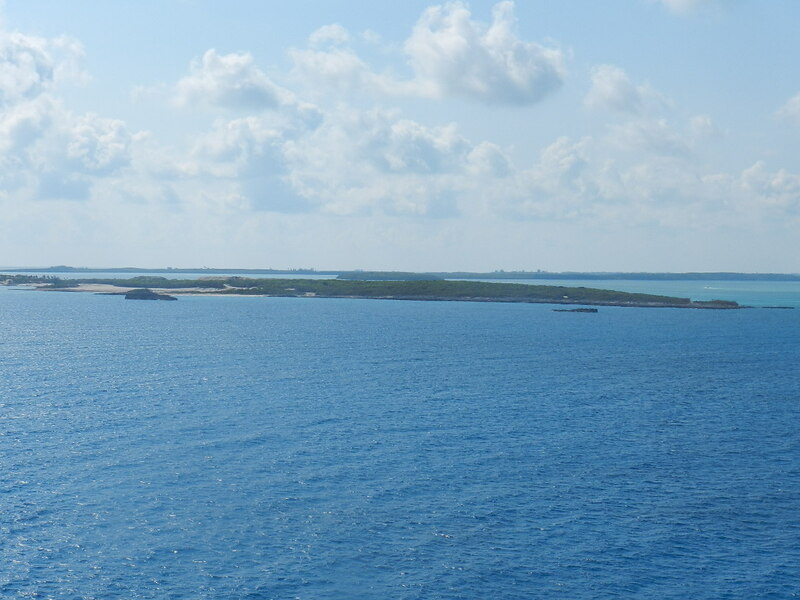 at this point in our trip no one has been sick and we are still so amazed at the blue water! 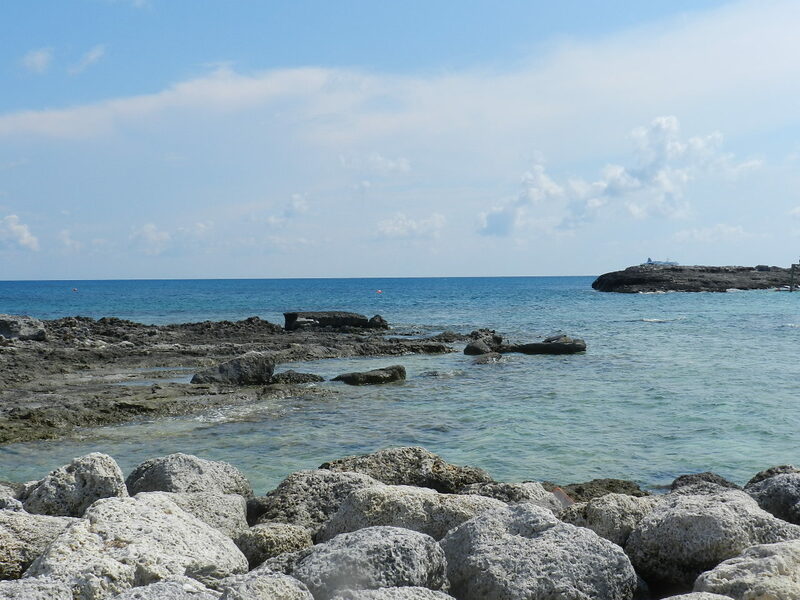 view from the lounge chairs…years ago i was at this island and slept in the sun and woke up burned….really burned….so this time we got an umbrella so we could have some shade…a gust of wind blew our umbrella into these rocks…andy had to chase after it. but we got it back and it was fine! the birds were everywhere looking for food. 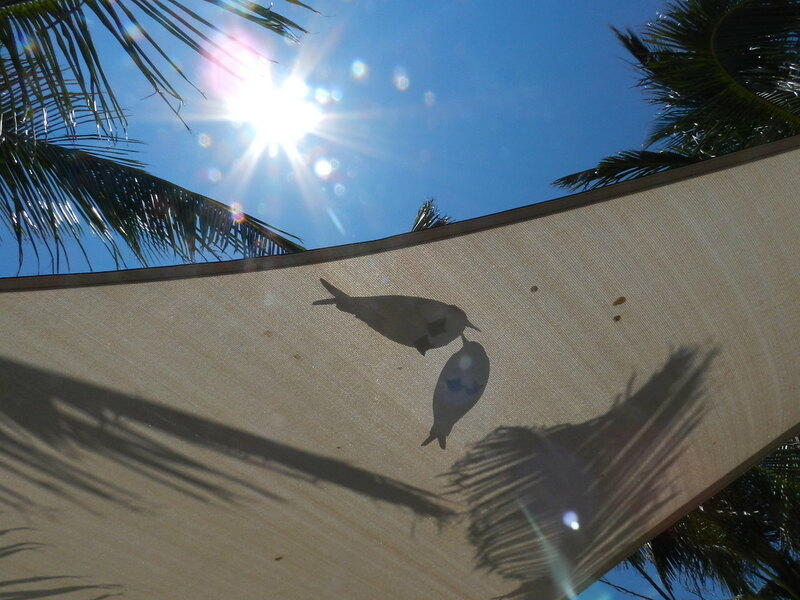 this was the shade above our table…but look at their cute little feet. 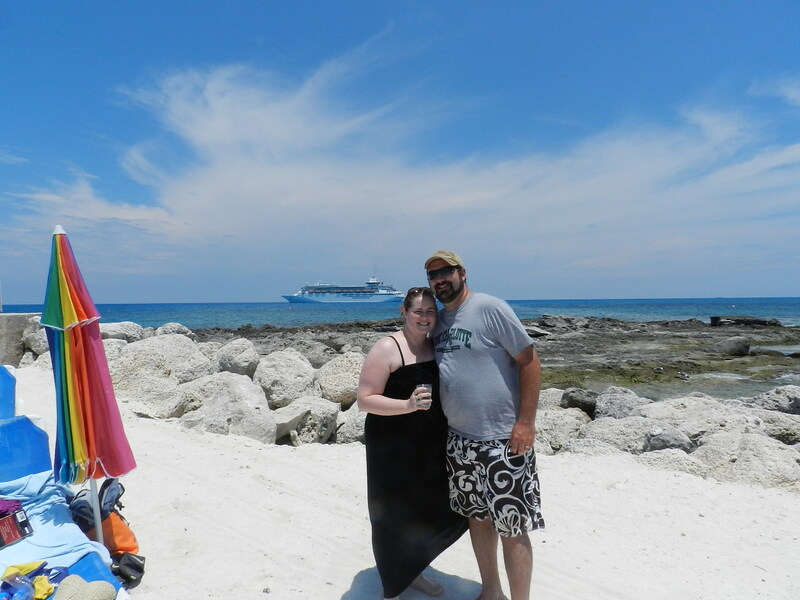 us with our stuff to the side and the boat in the back ground. 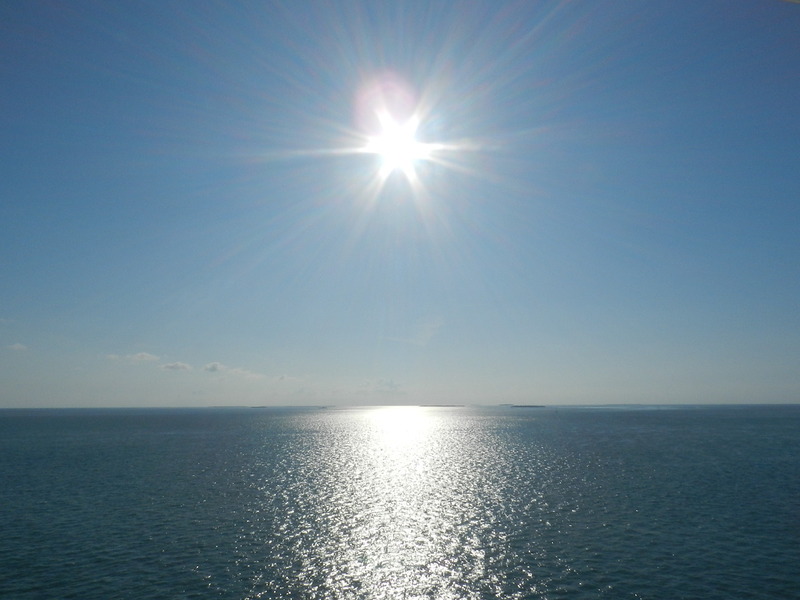 it was such a perfect day….it was a great day to spend my birthday! 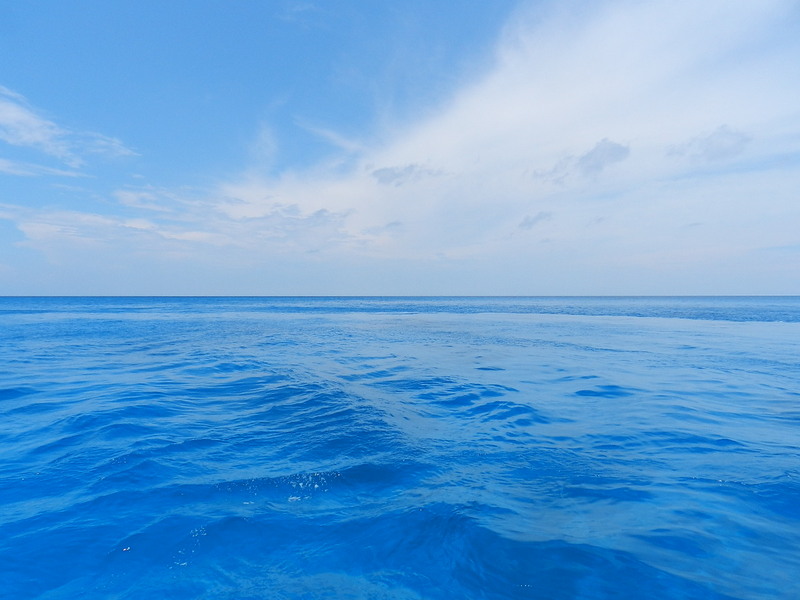 we have about a million pictures on the way back to the boat of the water….i still can’t believe how blue it was! that night was formal night. 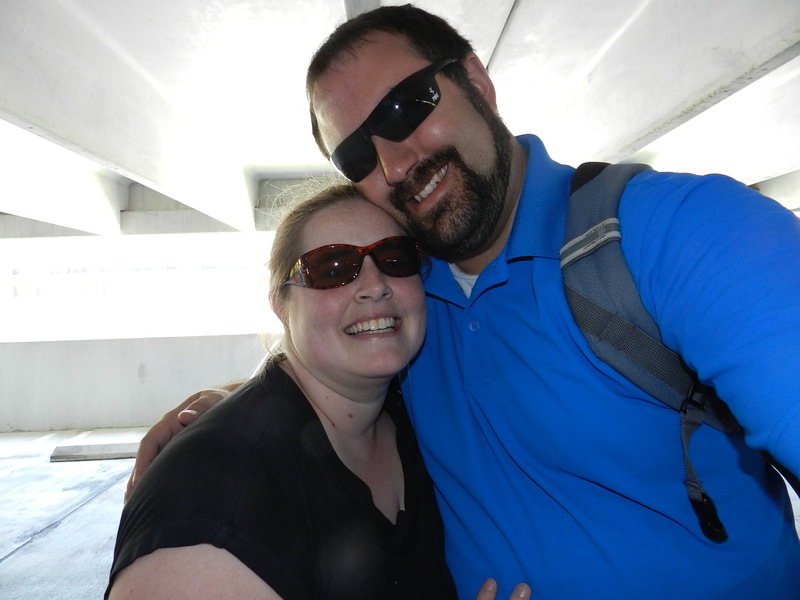 it was so fun…it was so windy that night but we did get a great picture inside and we bought it. 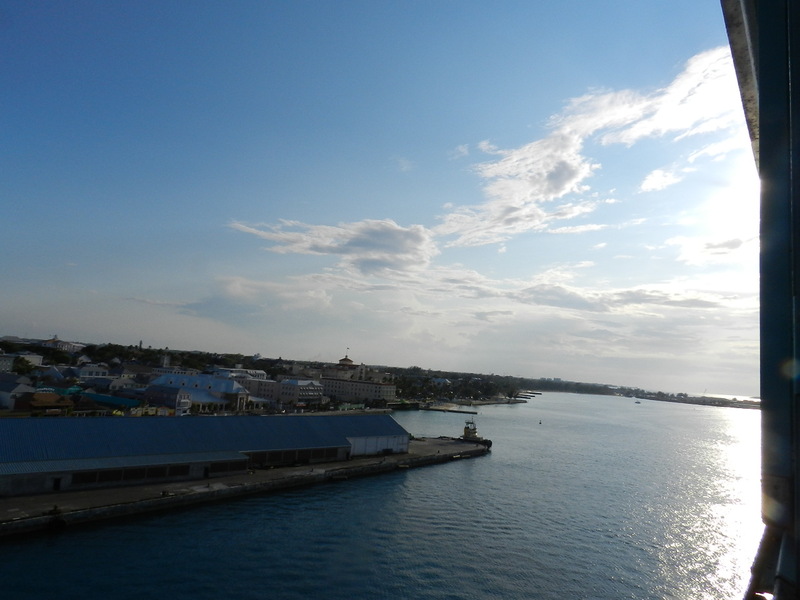 when we got up the next morning we were docked in key west. 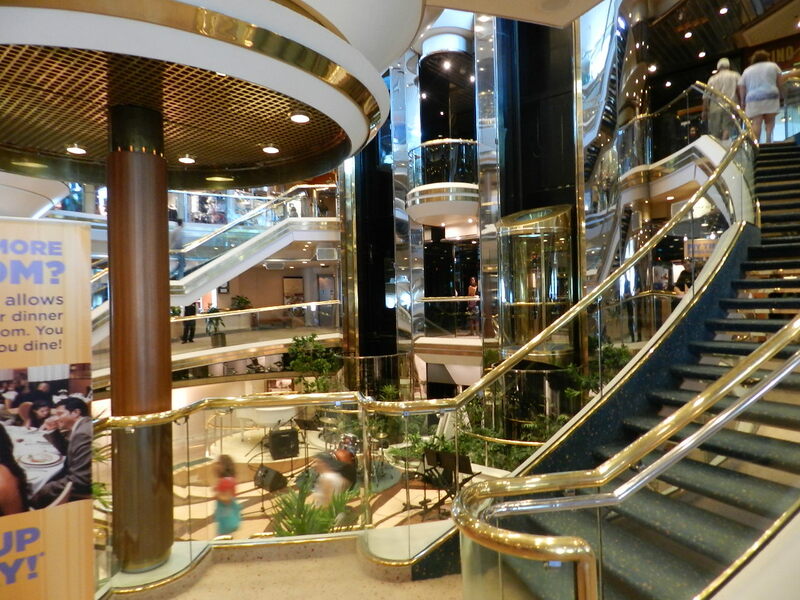 we had to do some custom stuff but then we got off the boat to explore. it was hot…and humid. this was the only day i was miserable because of the heat. the first thing we did was buy water. it came in handy. 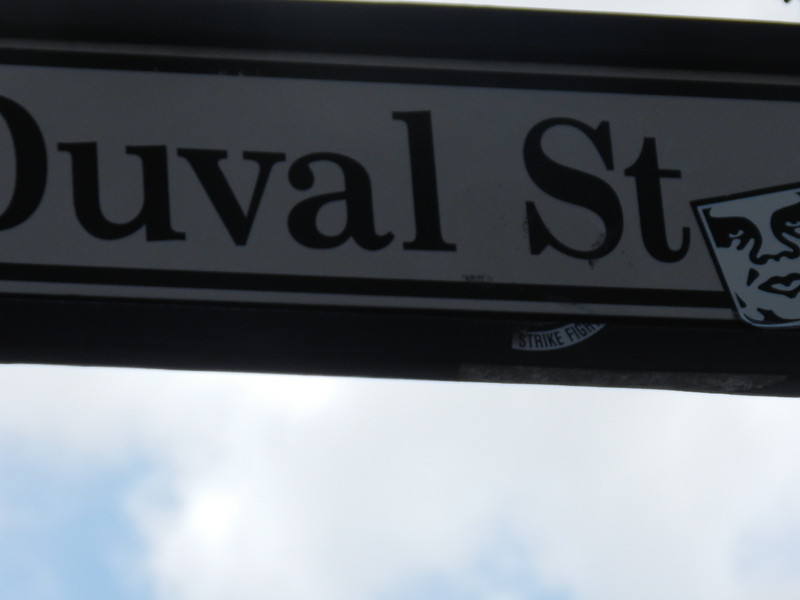 we walked down duval street. we didn’t do a ton of shopping but we walked by a ton of stores. this puppy was just sitting there in the heat…he was chewing on his book and toy every once in a while. 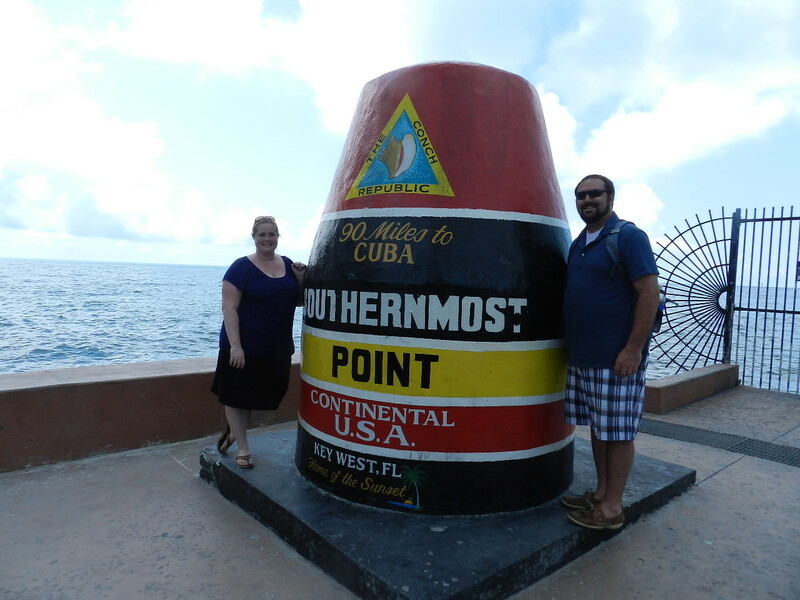 this was us at the southernmost point in the USA. it was pretty neat to be there and get our picture taken (granted we almost didn’t get it because someone didn’t know how to push a button but the people behind us were smart enough to get it done!). our waitor said that this was a neat place and worth going. it was really neat to see this home. we saw a ton of the cats. 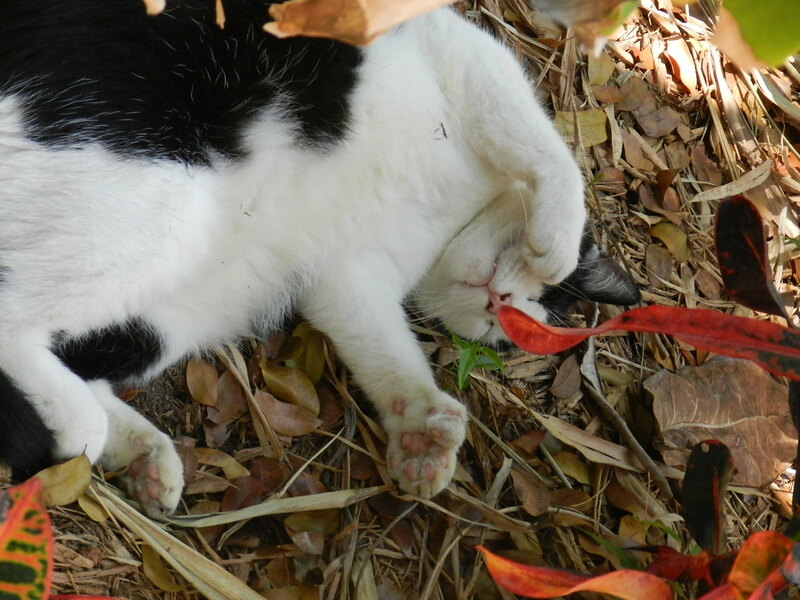 but there was a sign to not pick them up…but i still got to pet a few of them. we saw this and had to take it for cj! 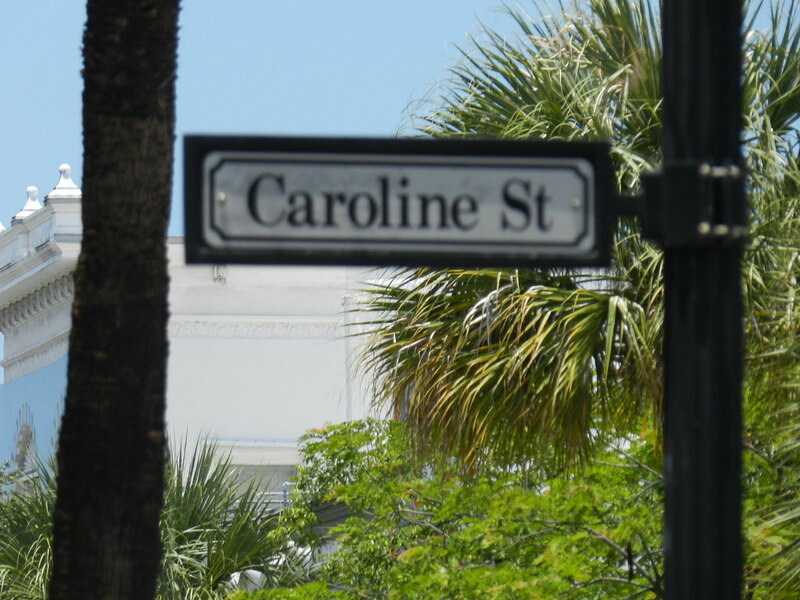 the funny thing is on caroline street we saw…. ride the bull!!!! the street sign for cj and this pic is for erik! 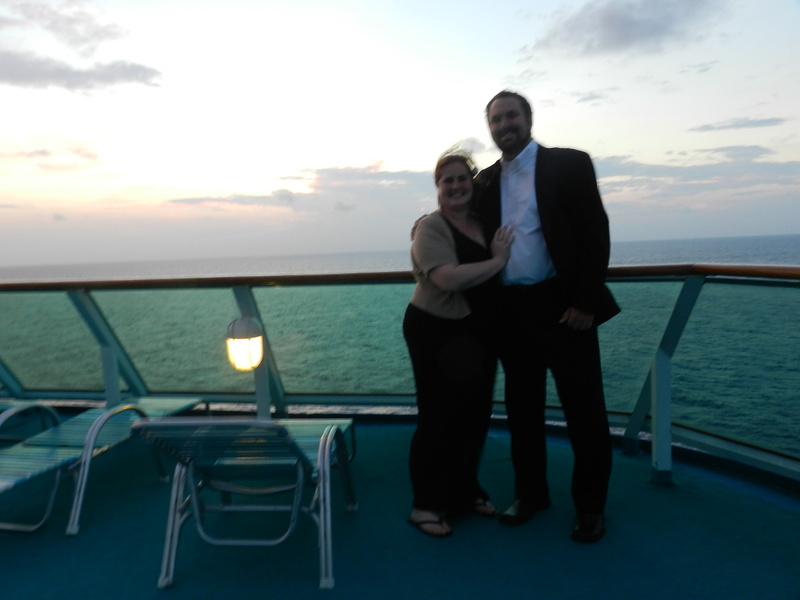 we had to be out of the port before sunset so andy took this one as we were leaving the port. we were getting everything packed up and imade came to make sure we were doing ok! 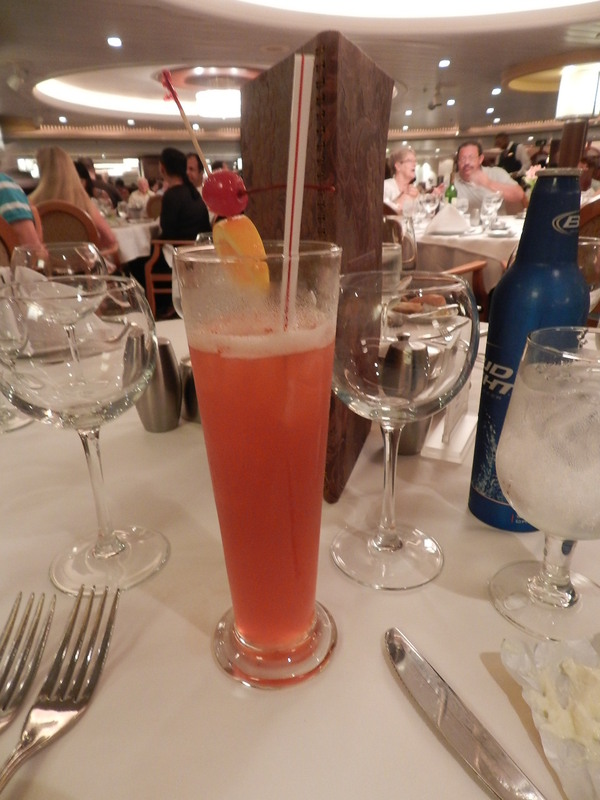 that was our table…and you can see my drink…it was the captains punch or something….but it was good. 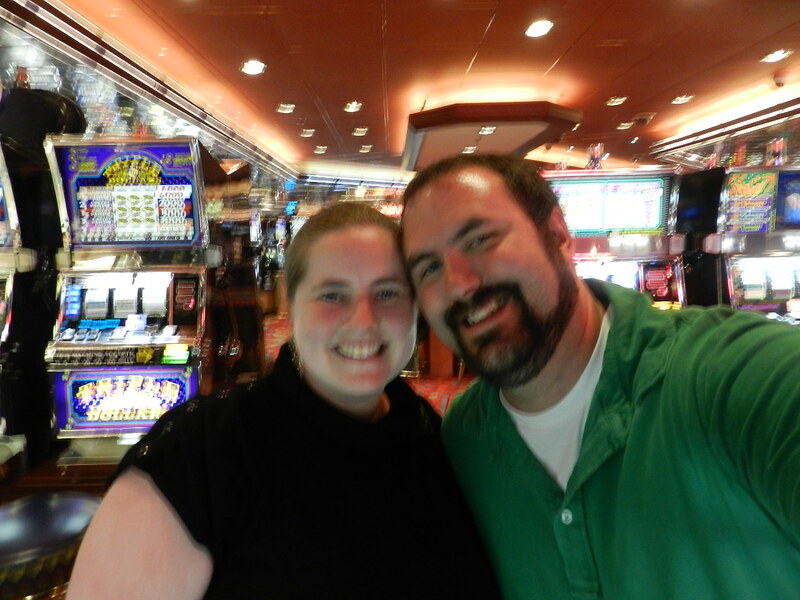 we had a blast in the casino….we didn’t win or anything but it was still a blast. 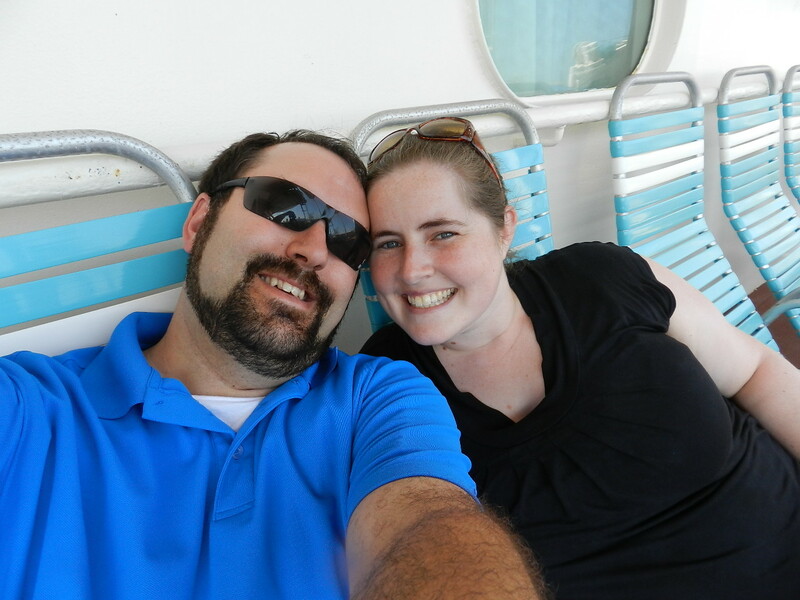 we had a great time on the cruise. 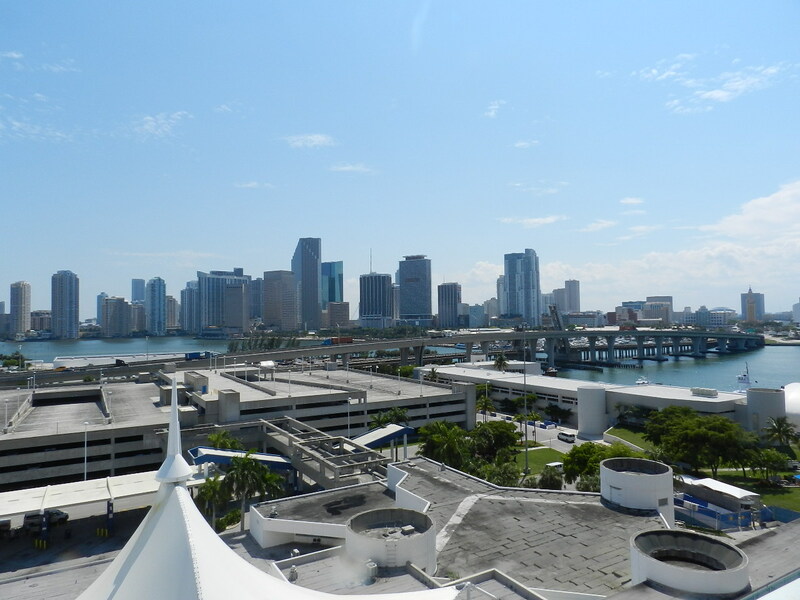 when we went to bed we woke up in miami. we had to hang out on the boat until we were called. we didn’t have to wait long on our luggage. we grabbed it and ran to the car. we ended up driving all the way home that night….we don’t have pictures of the trip home because i was sad our trip was over! 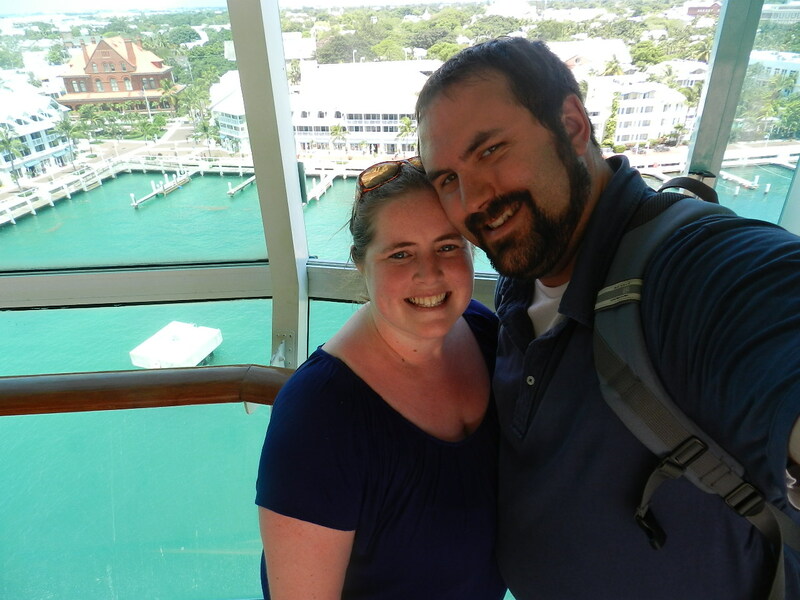 anyways i know it was a long post and it was hard to go through almost 900 pictures and pick out my favorites but there it is…..hope you enjoyed our second honeymoon pics! as i might have mentioned in my previous post sunday was a wonderful day. we slept in until about 830 and got up and got showers and went to breakfast. we stopped in at denney’s and sat with the millions of people that i knew were going to eat and run to seaworld and block everything so we couldn’t see…ok so i guess i can be dramatic and let my imagination run away. 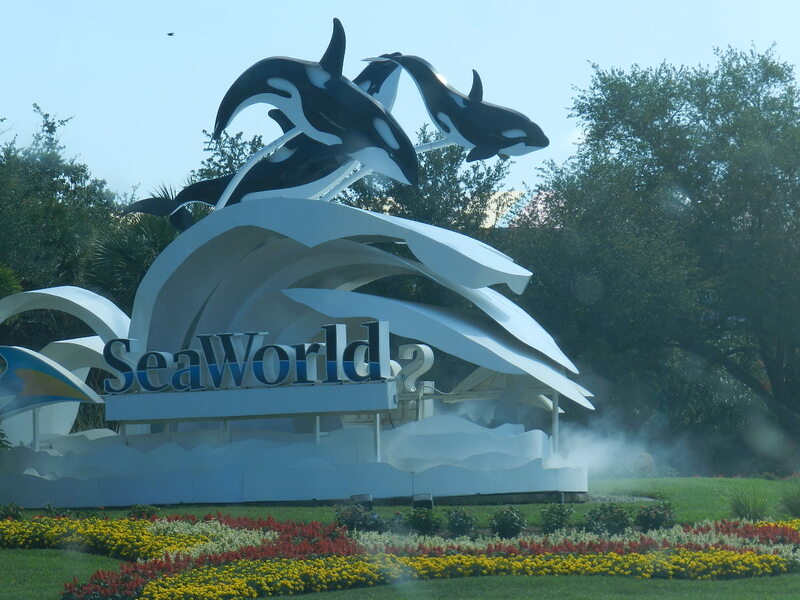 so after we ate our yummy breakfast we punched in our gps and drove to seaworld. sorry for the fuzzy spots on the windows! 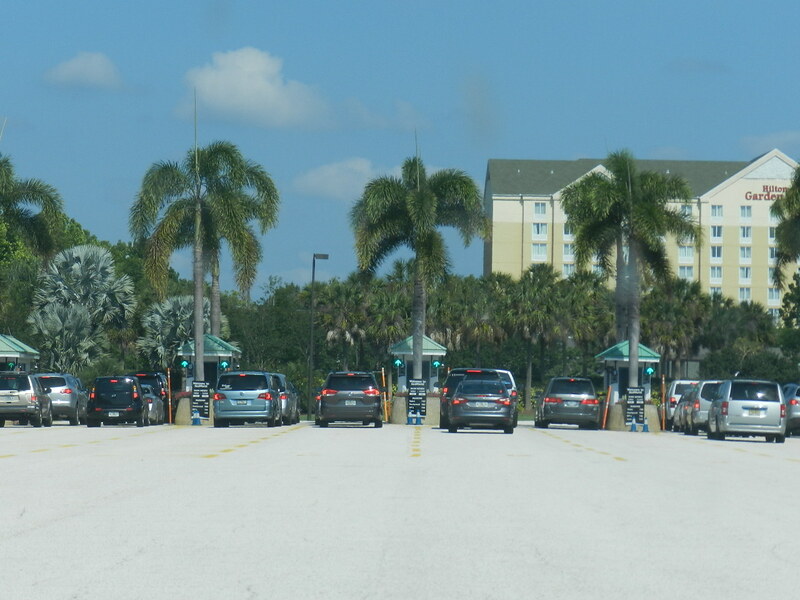 we had to pay for parking and then we followed the rest of the cars to park (i will spare you pictures of us going to our parking space). 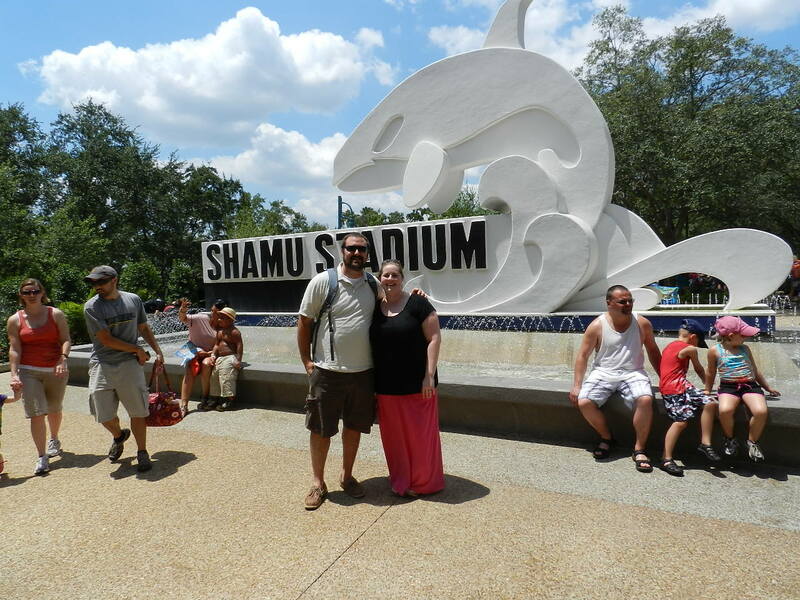 i kind of wanted to get our picture with shamu but andy insisted we not do that (i will say i really didn’t want to wait in line so i guess i’m not too bummed about it). 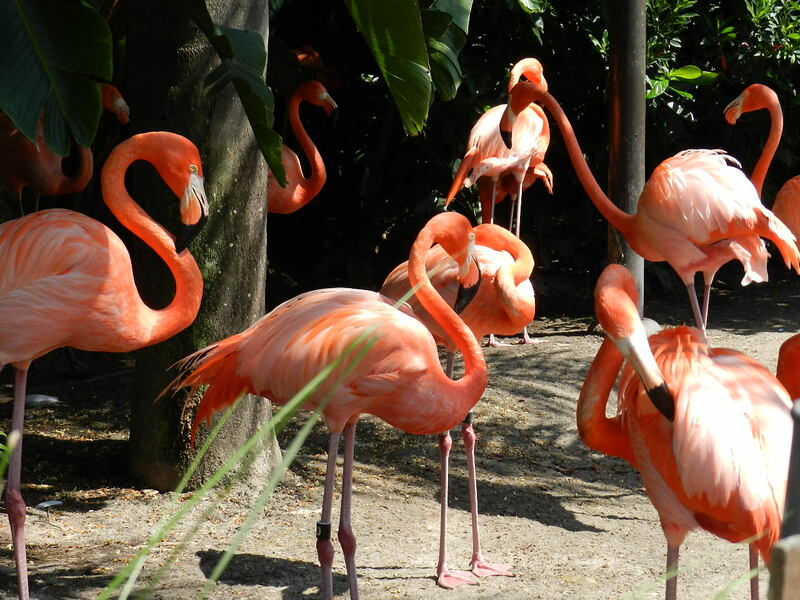 we saw a bunch of them just standing around…we saw a few on nests. we got our map and a schedule of the shows and decided to make a plan. we went to all the shows that were there. the first one was a really cute one with pets (normal animals). 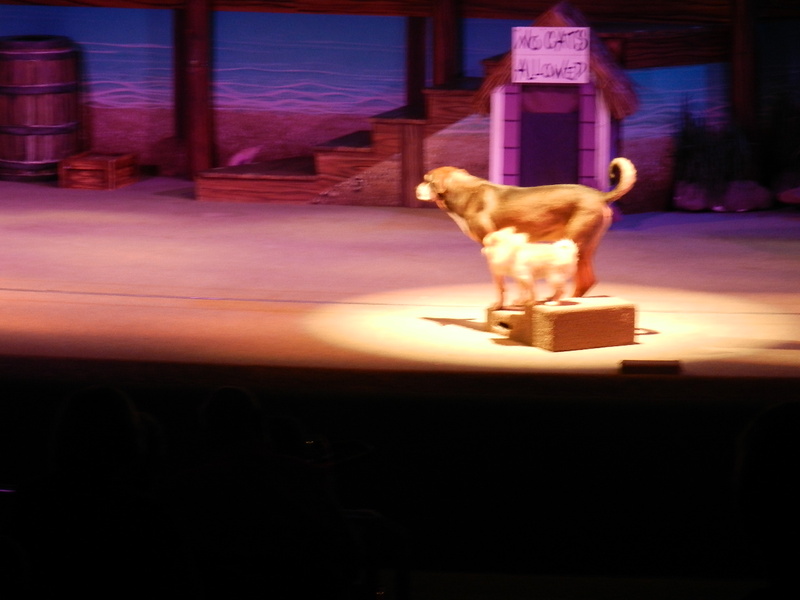 they told us that all the animals in the show were all rescue animals. it was a love story about two dogs. 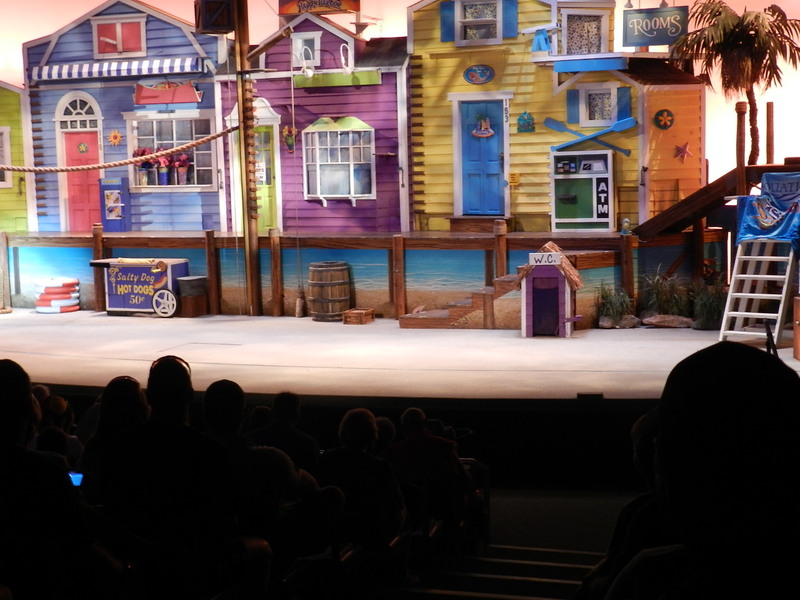 at the beginning a rat ran out of the set (which was amazing) and a cat chased it around the town. the rat ran into a dog house and the cat followed and a dog ran the cat out of his house. there was a pig, skunk, birds, cats, dogs, and rat. they did wonderful tricks. 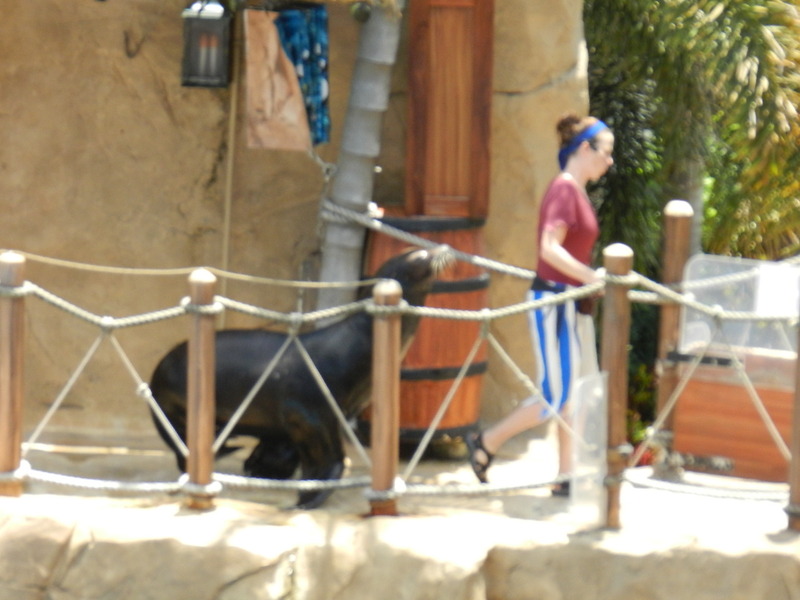 it was funny seeing the animals perform and the human interaction. a cat missed his mark but he realized it and did it. the skunk had to go back and do his trick again because he got side tracked. it was a really cute show. on the set a lot of the doors and windows would open and some trap doors for the animals to go through. he came out of the blue trap door and should have ran across the stage…but he wanted to smell around a bit. not a great pic…but the pig! 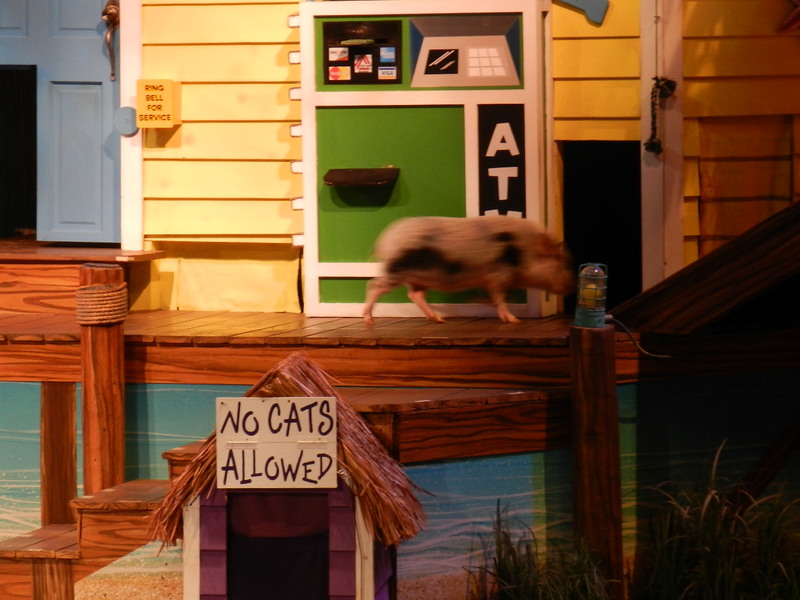 the pig was so cute…(the house below was where the bull-dog chased the cat out of). 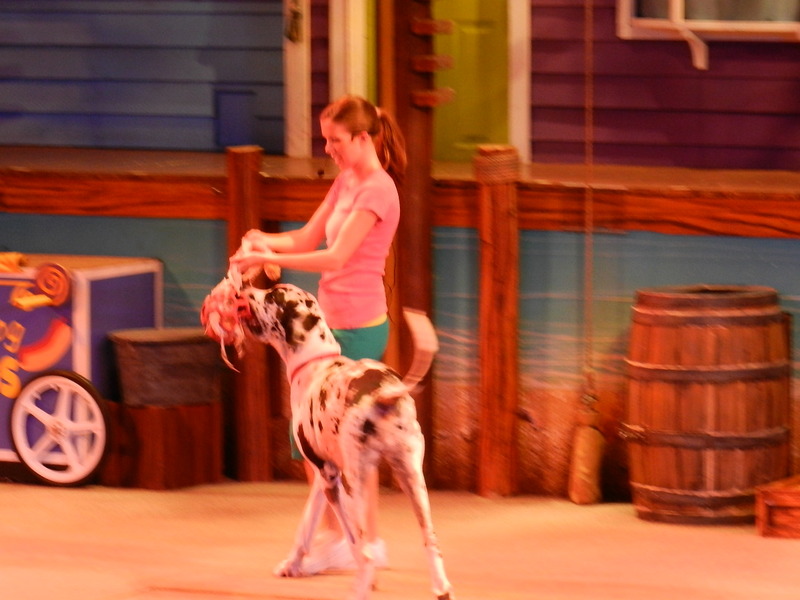 this was a beautiful great dane! he is new to the show so he didn’t have much of a part except to come out and play with his toy…they are trying to get him used to the noise and the people before they write him in. 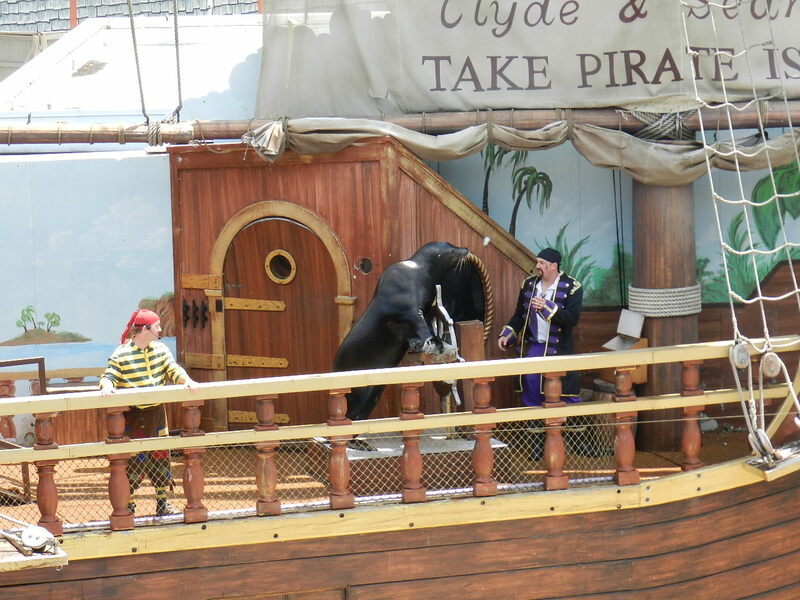 he was so beautiful and now i want a great dane….when we have a huge yard for him to play in…after the show they let the people come down and pet the animals….we went on since all the little kids where at the stage…we went on to see the sea lions….they were awesome! andy looking at the dead one…. ok it wasn’t really dead…but it looked like it. he was trying to get some sun! 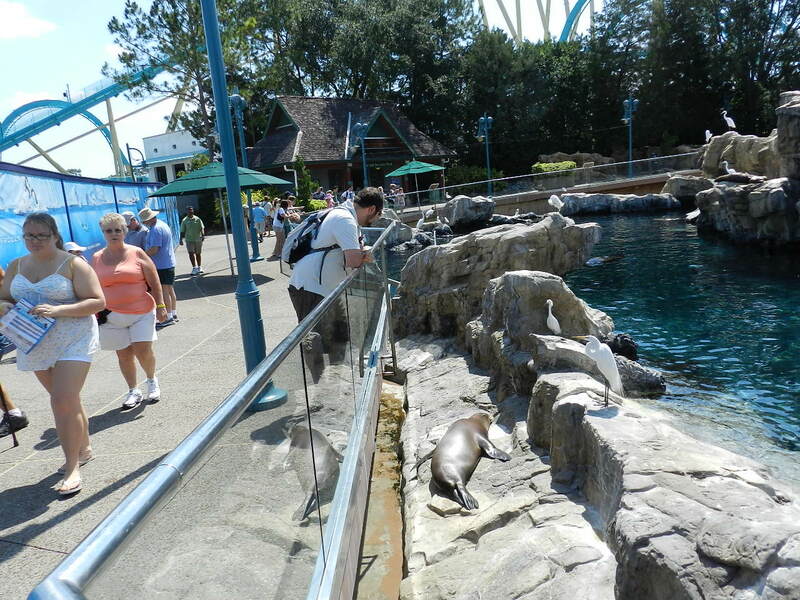 people were paying to feed them and this guy and the birds got a ton of fish…he was yelling at the people because they didn’t feed him fast enough. it was really neat to watch that. most of these guys just floated around or sunned. 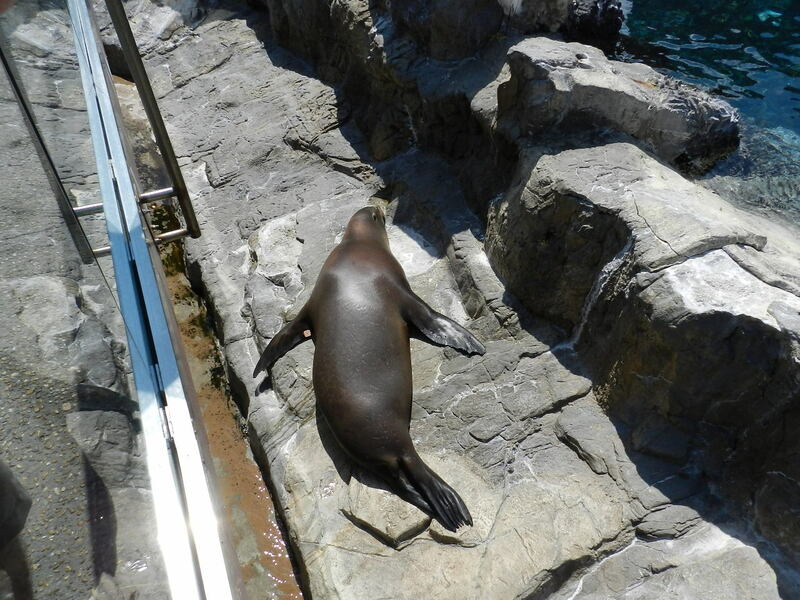 i loved that this one was floating with his feet out of the water…it was so funny to watch him drift around their mini sea. 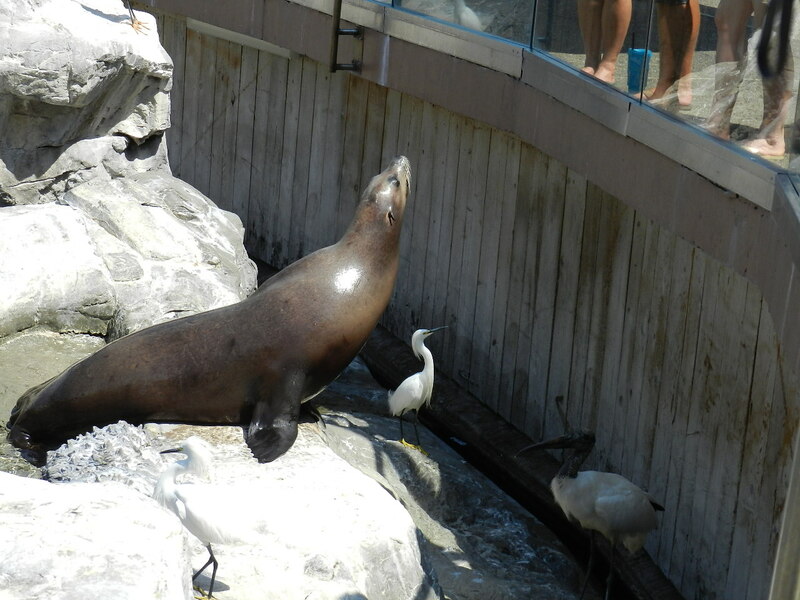 after we looked at these we went to see the show that featured the sea lions. we went on the last day possible. 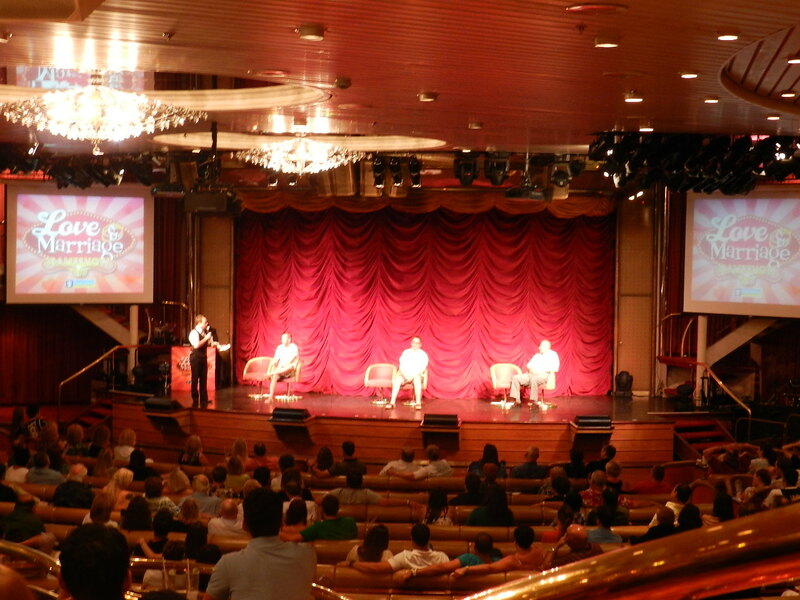 they were closing the show to make improvements and changes (renovations). it was funny to see how relaxed it was. 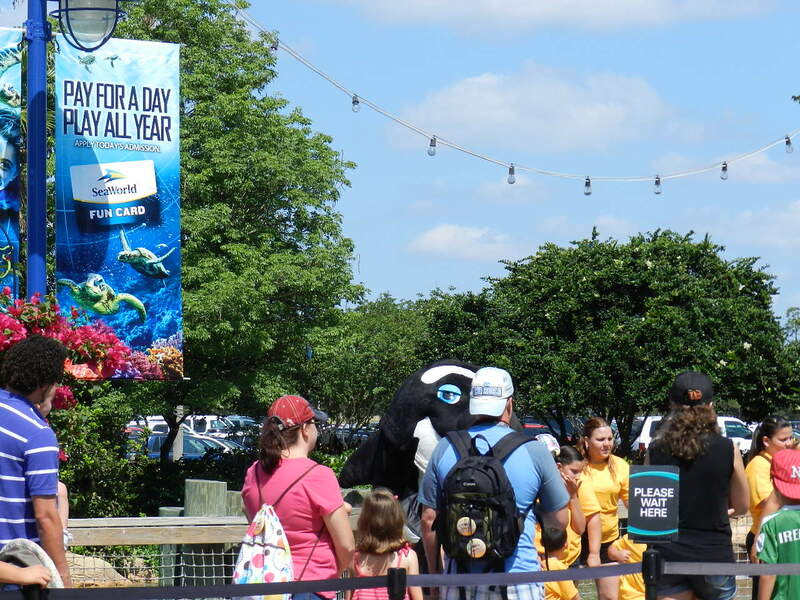 the animals missed some cues and the humans messed up too. 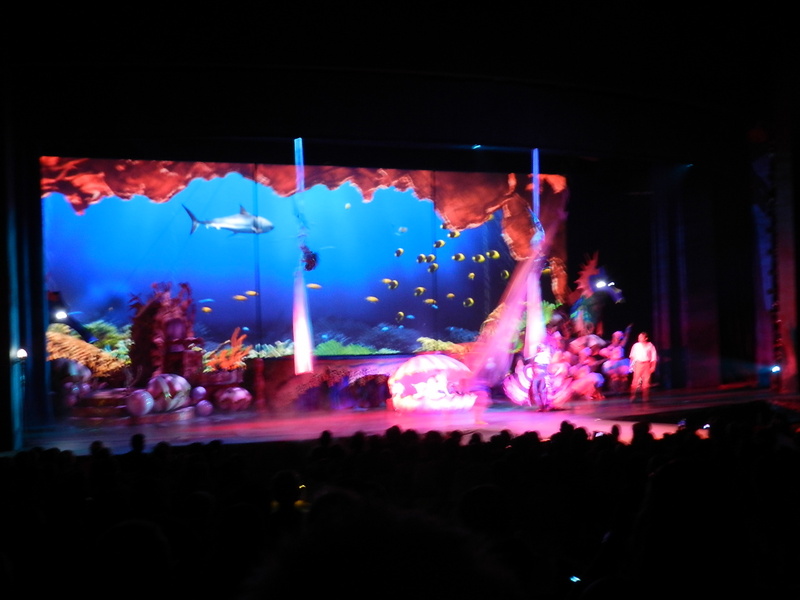 it was great watching the “actors” laughing at the mishaps and it didn’t take anything away from the experience. it was driving the boat! 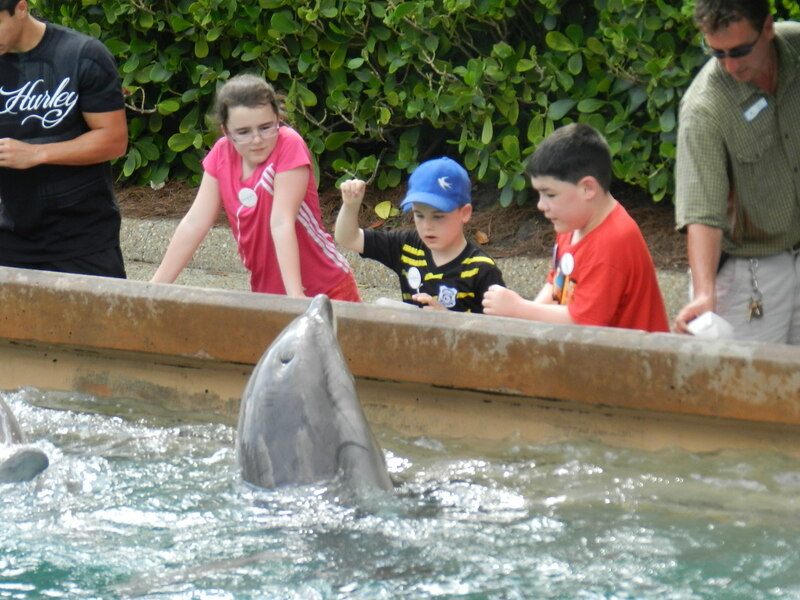 they came out into the stands and a little kid got to shake his hand (flipper). it was really cute. they got to eat during the show (a lot). this was one of the times they “messed up” but they played it off wonderfully and it was great. 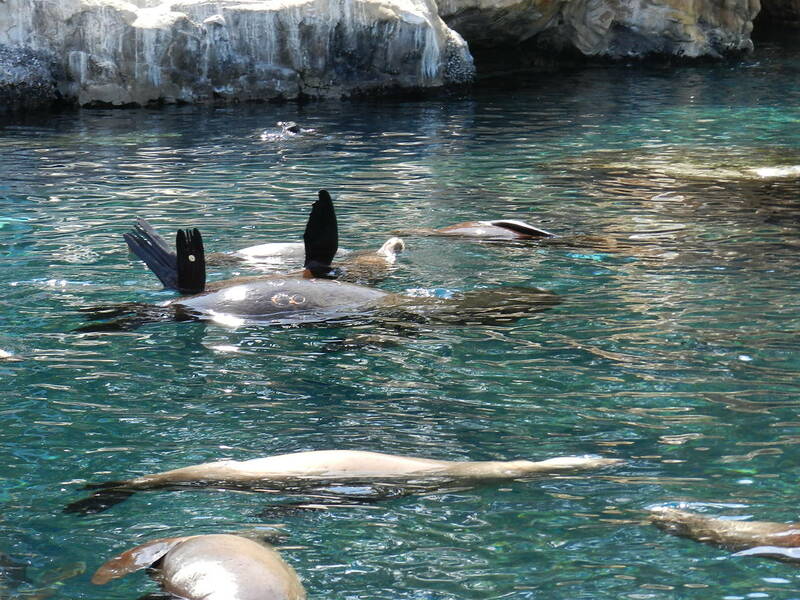 we didn’t get a pic of the little otter because he was too fast…but it was super cute. 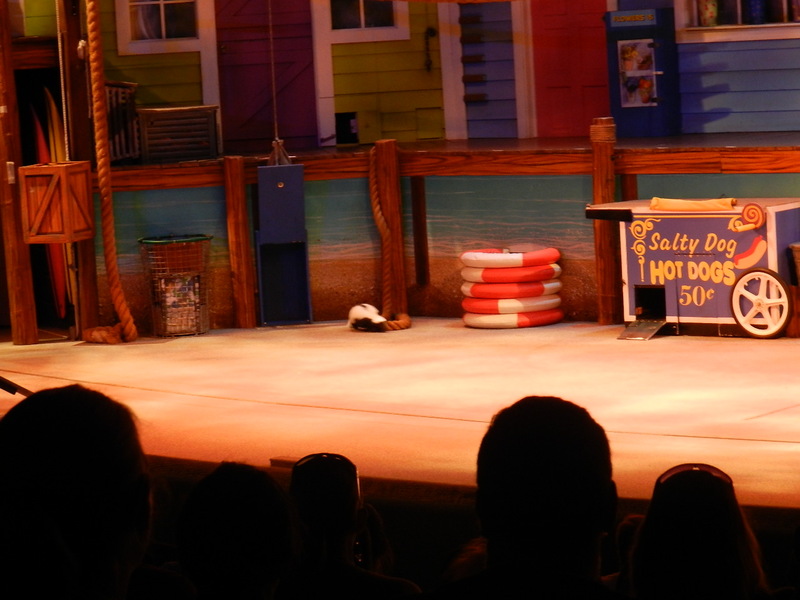 after this show we went to the shamu show and i talked to my dad for a minute. while i was on the phone with dad…andy got us a water. 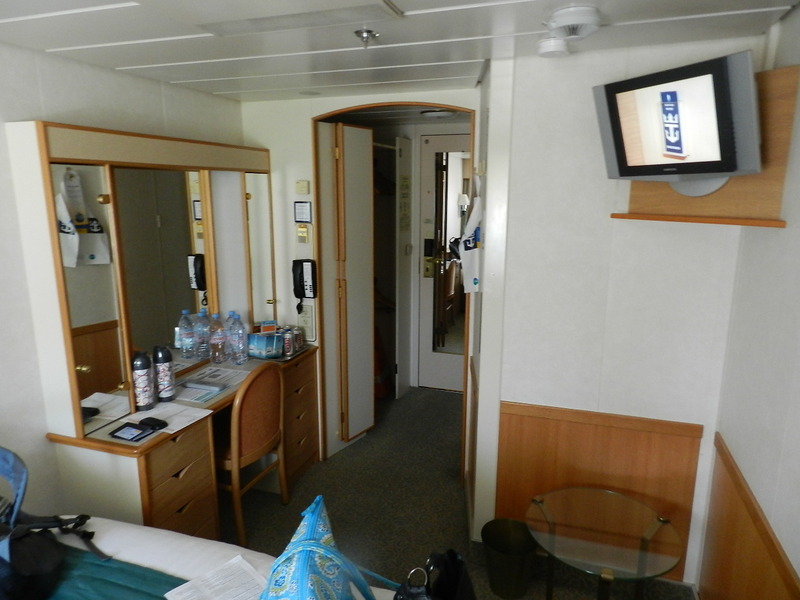 i didn’t know we could have brought our own drinks in…but it was ok. it was hot but not humid so it wasn’t too bad. 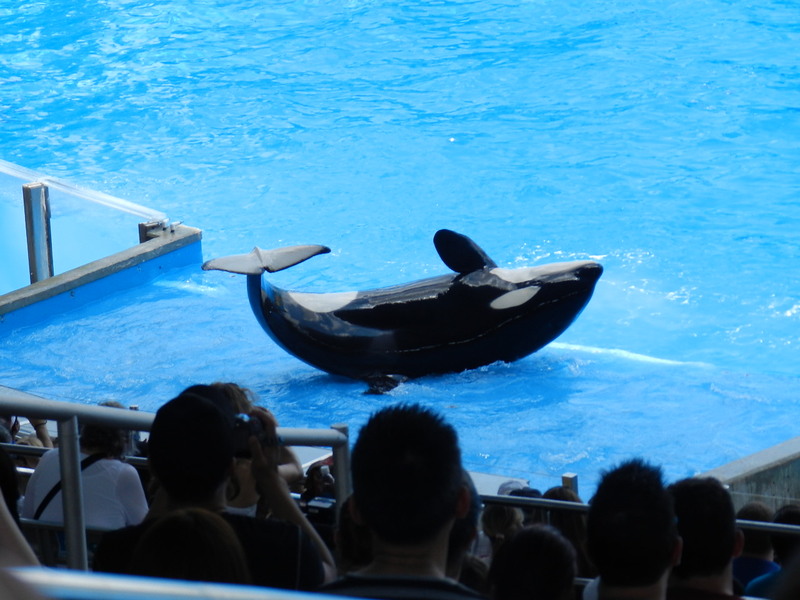 after we got off the phone we went to see shamu. 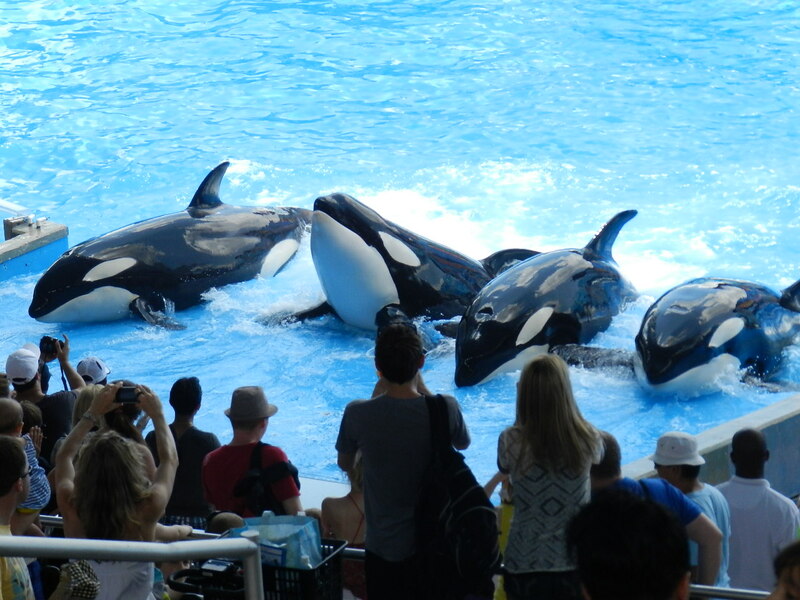 i will admit i was a little sad and disapointed…years ago i remembered this show a little and remember the most the trainers in the water with the animals and being tossed in the air etc…since an accident a while ago the trainers weren’t in the water with them at all…but it was still amazing to see the whales swim and do their tricks. 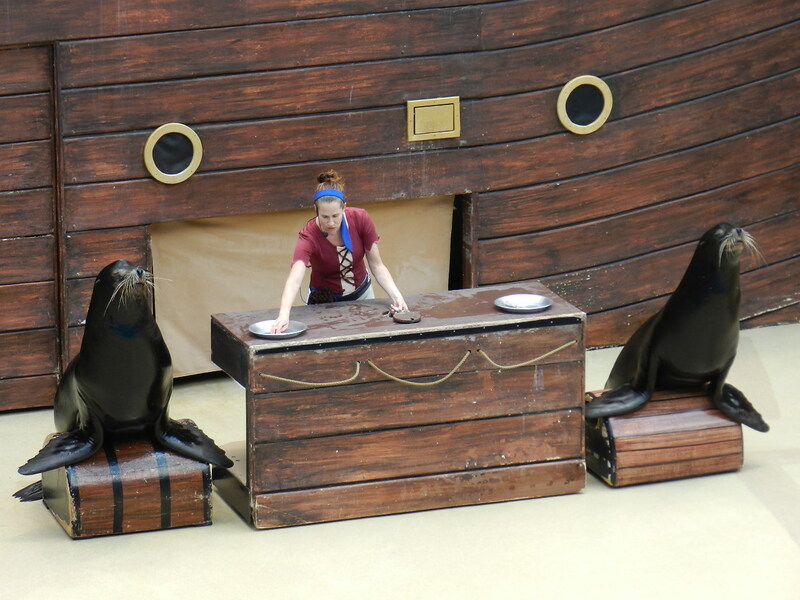 i will admit we didn’t sit in the splash zone….and after the show i was so glad…those people got soaked! after the show we went to another weird show….it was inside and some people around us needed a shower so it was a little distracting. 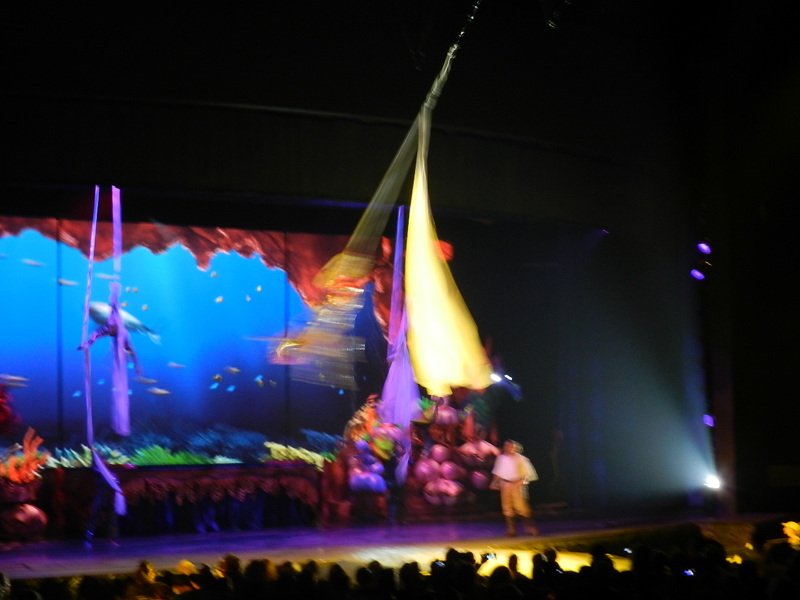 it had a ton of acrobatics in it but it was really neat. they had fun costumes and used black lights and strobe lights…it was neat. 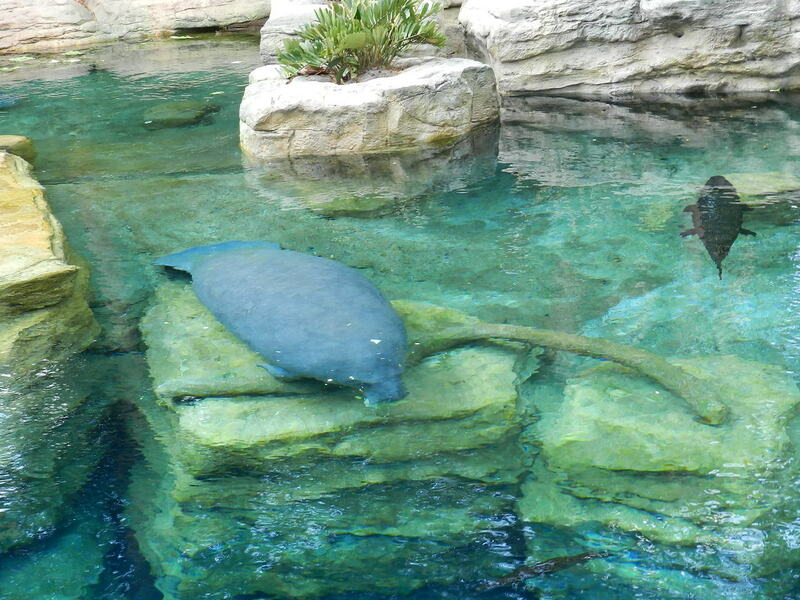 while we were standing there the lady came over to feed the manatees (sea cows). he got a head of lettuce! this was at the dolphin cover. it was neat to watch them play under water. 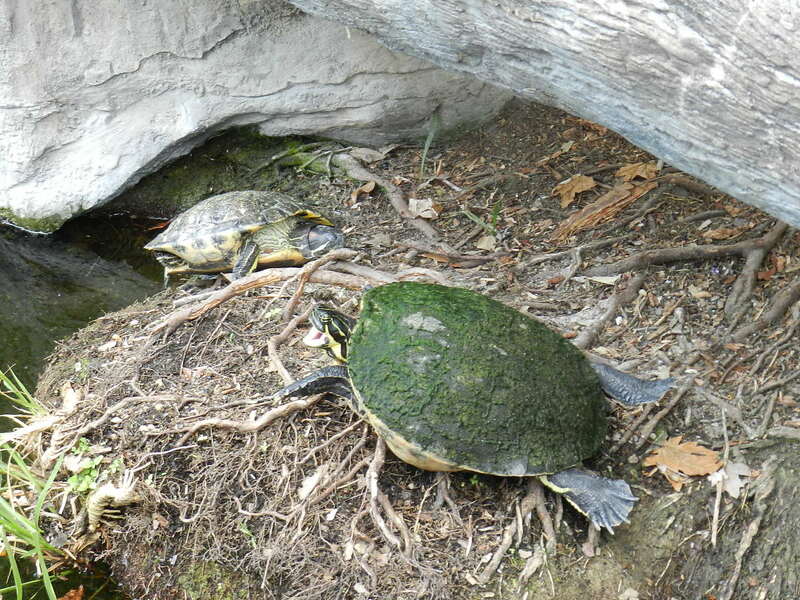 they came over to where i was (my arm to the left) and swam in front of me…i was taking a video. it was neat. 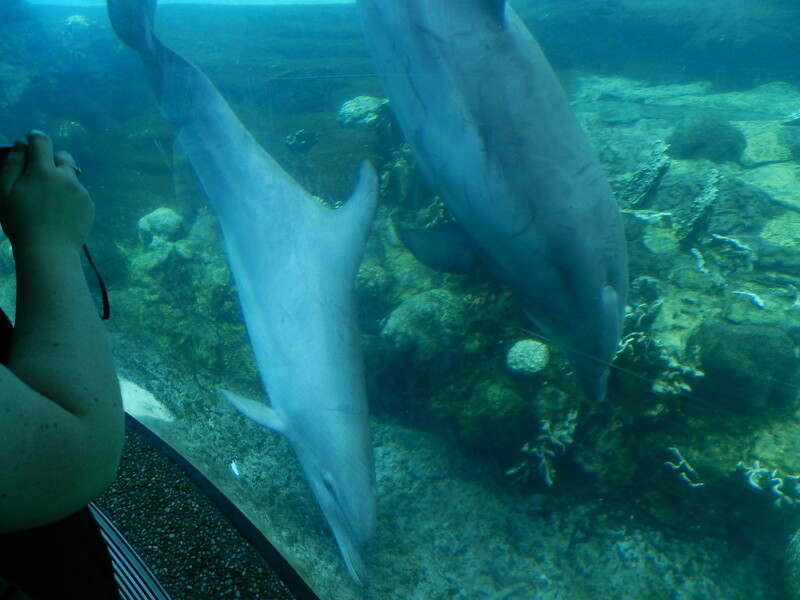 you could pay to feed the dolphin…i would have liked to but the line was too long and we didn’t want to wait…i was good with not waiting. this kid got to feed them and had a blast! so close i could touch it. 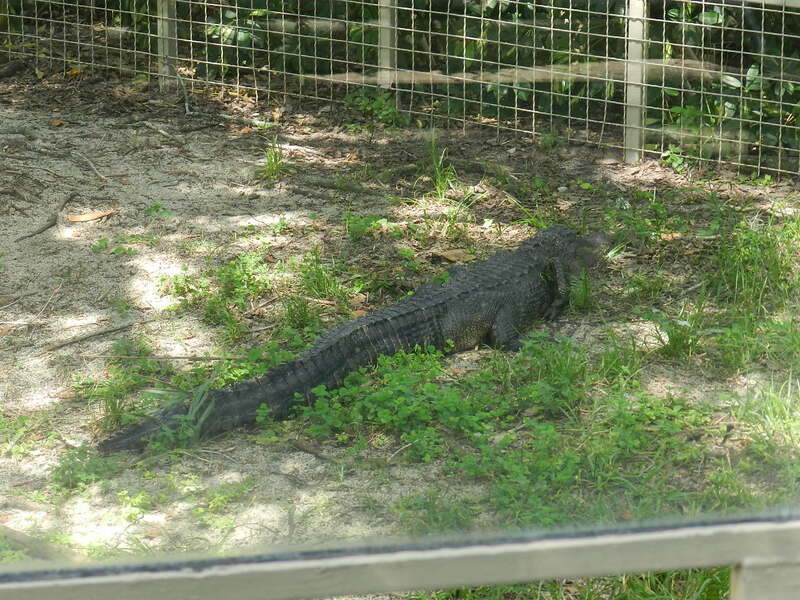 i was so close to touching it (about 8 inches or so) and he was coming to me and then a kid came running over and yelled so it fled…oh well….so close! 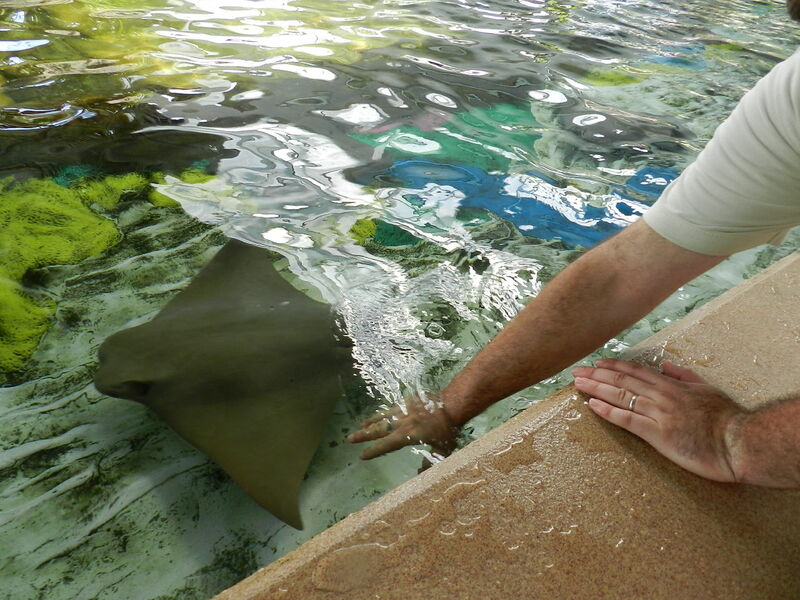 we got to pet a stingray. it was so neat. 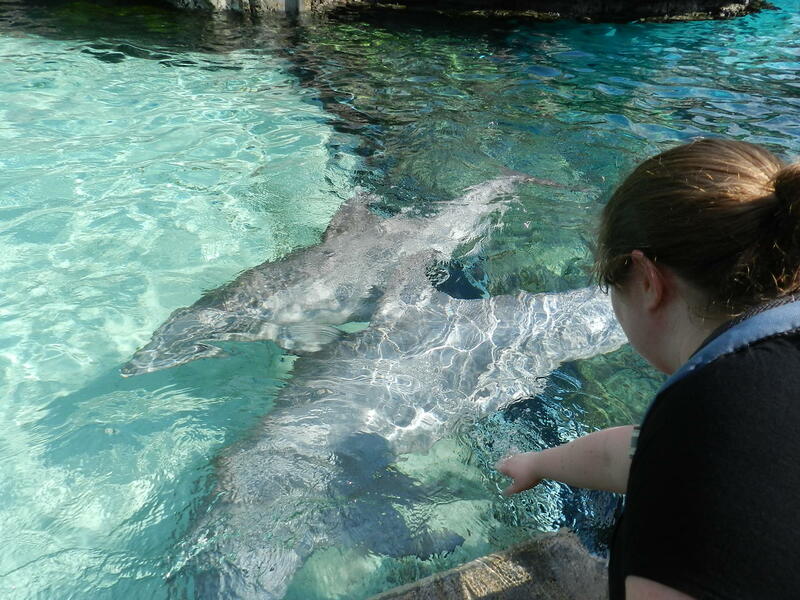 they are slimy little things…one of them came out of the water and splashed me….that wasnt nice…but that is ok. we stuck around there for a while to pet them….andy was a little scared at first but then he warmed up to it. 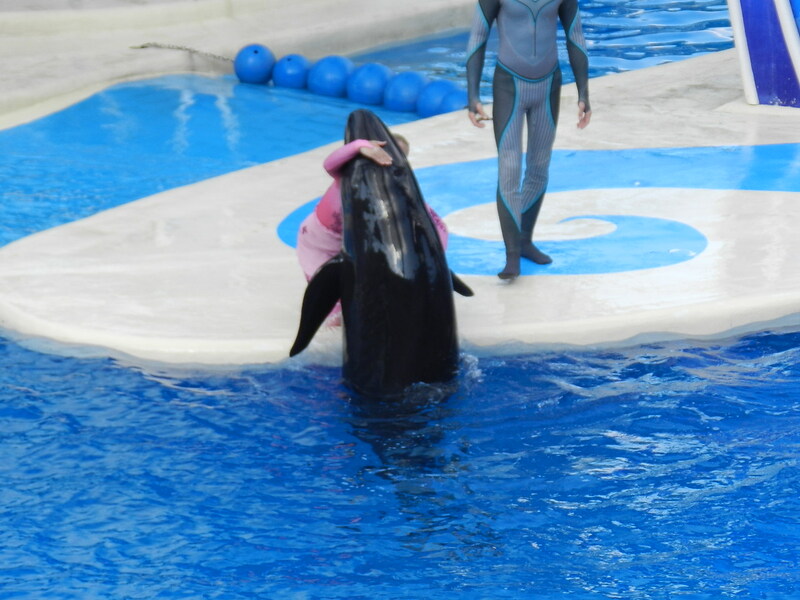 we went to the last show which was the dolphin show. 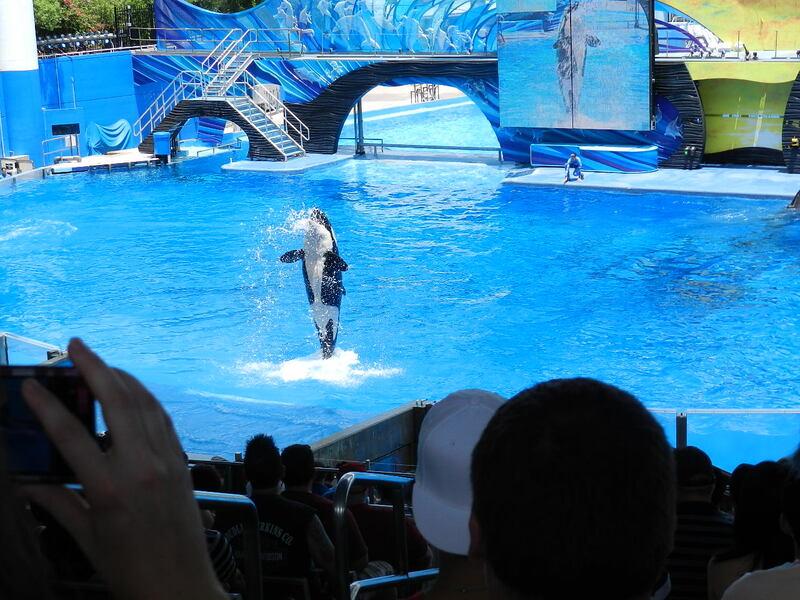 it was different than the shamu show because the trainers were in the water with the animals the entire time. it was so fun to see them work together. it was also different….as in weird different. i didn’t really get the story line but it was still neat. 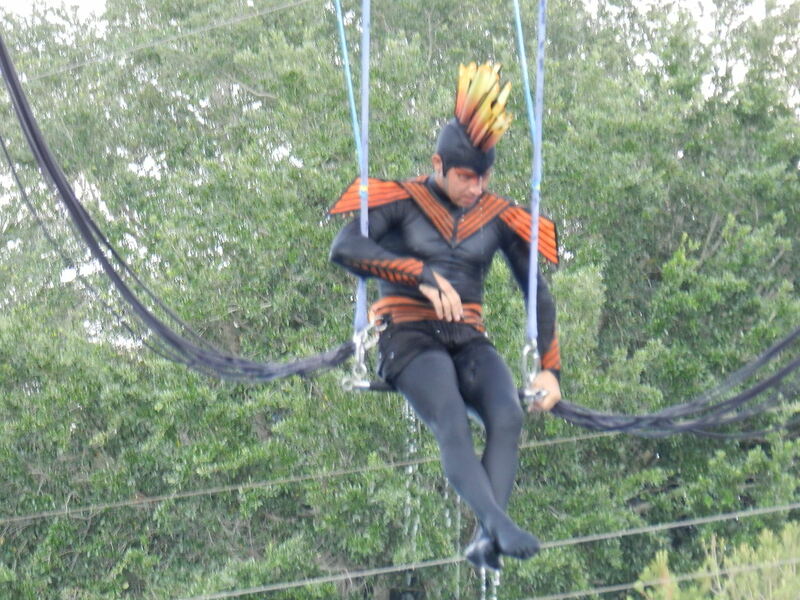 the weird bird man was on a bungee line and did flips and things into the pool. i don’t know why but it was a hug….it was sweet! 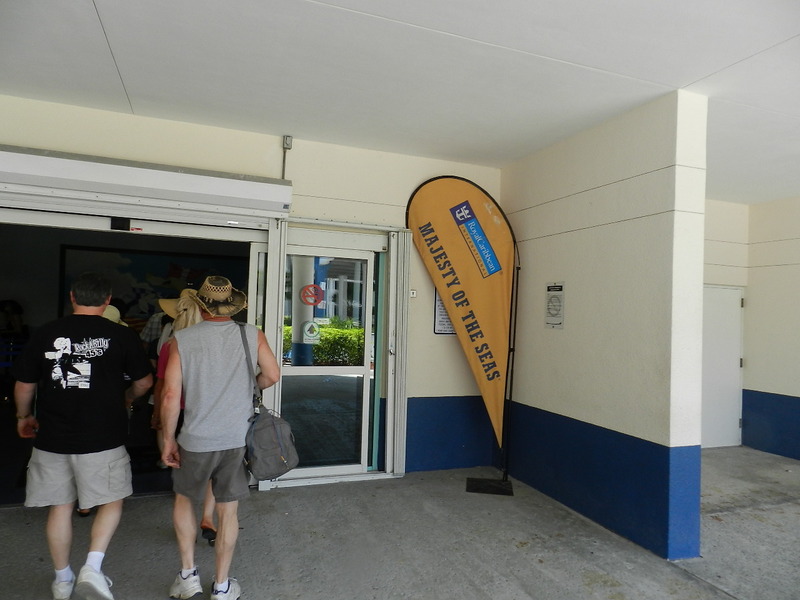 after this show we had seen 5 shows all the exhibits and were ready to go get cleaned up and in fresh clothes. we went back to the room and got showers and went to smokey bones for dinner. 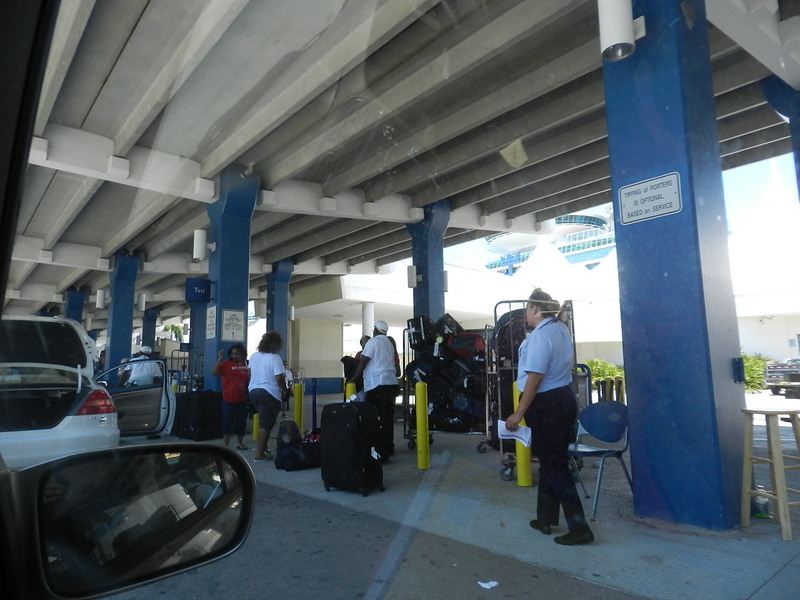 after that we went back to the hotel….did a load of laundry…repacked our bags and slept so we could get up early to go the rest of the way to miami!